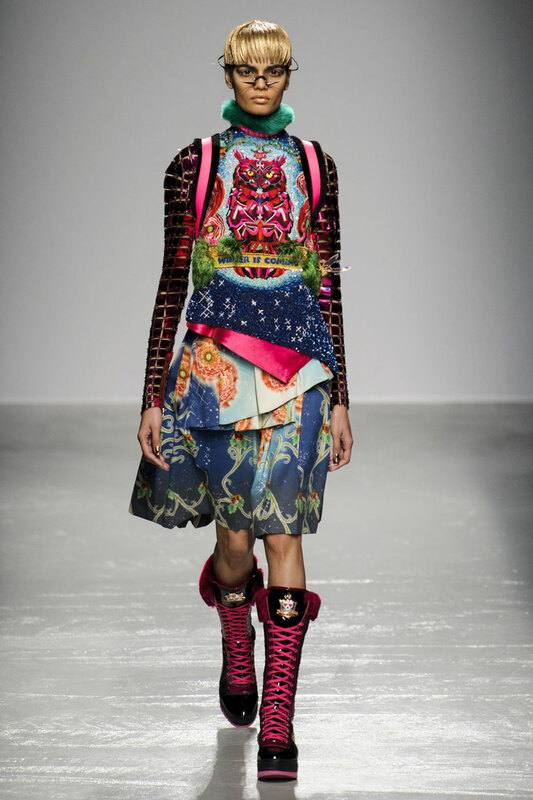 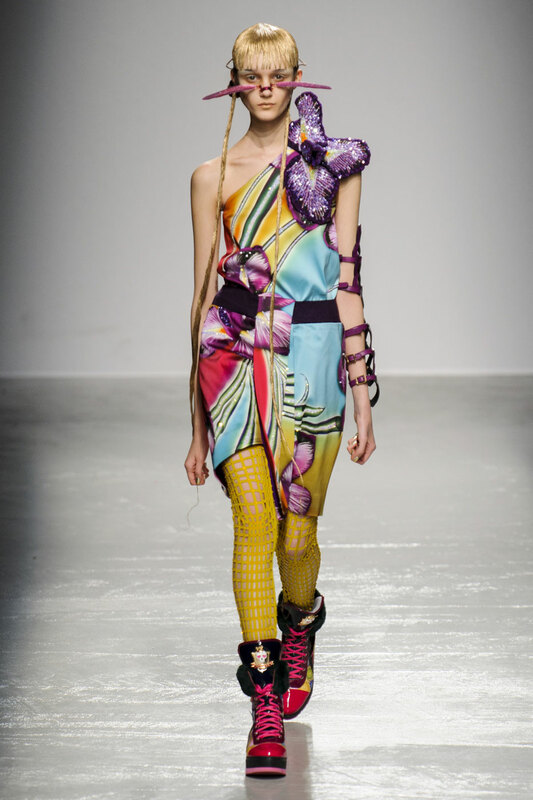 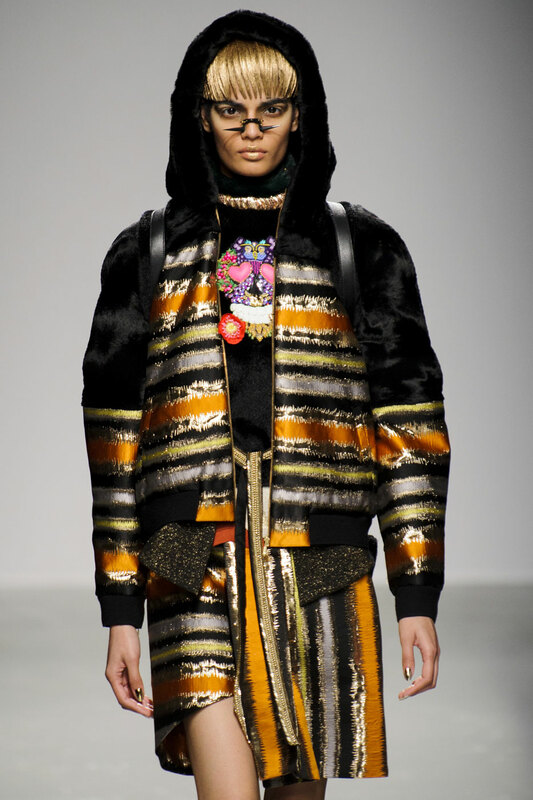 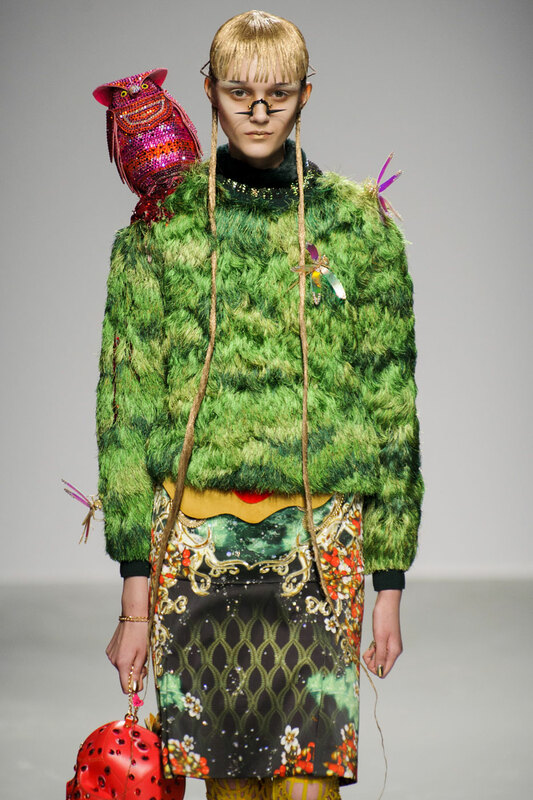 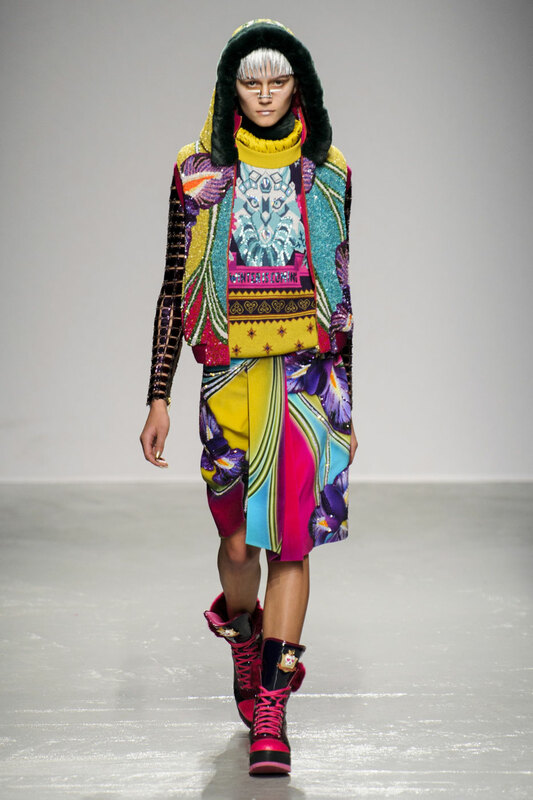 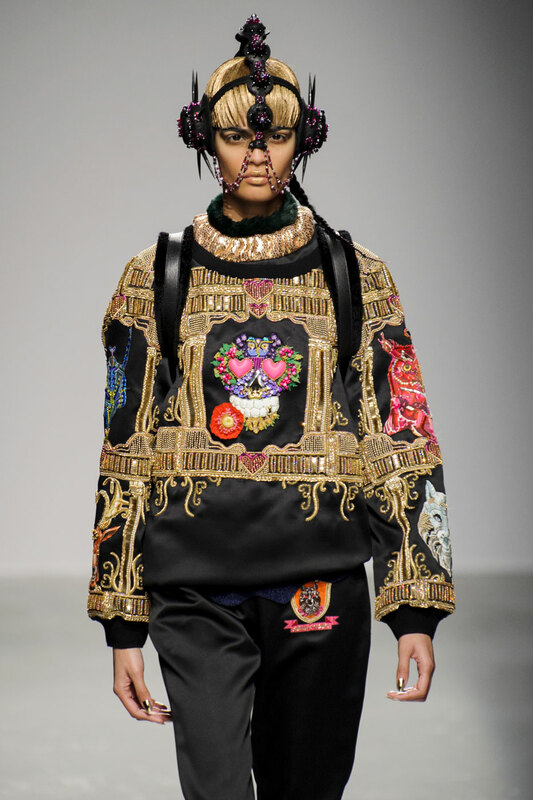 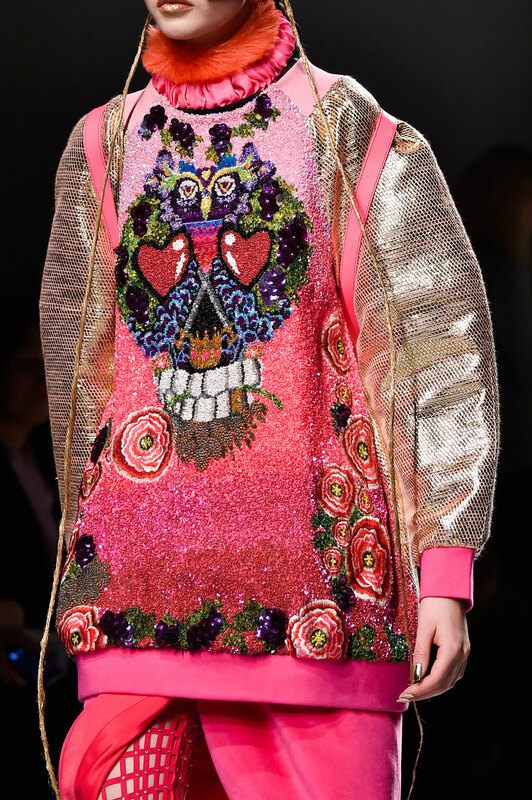 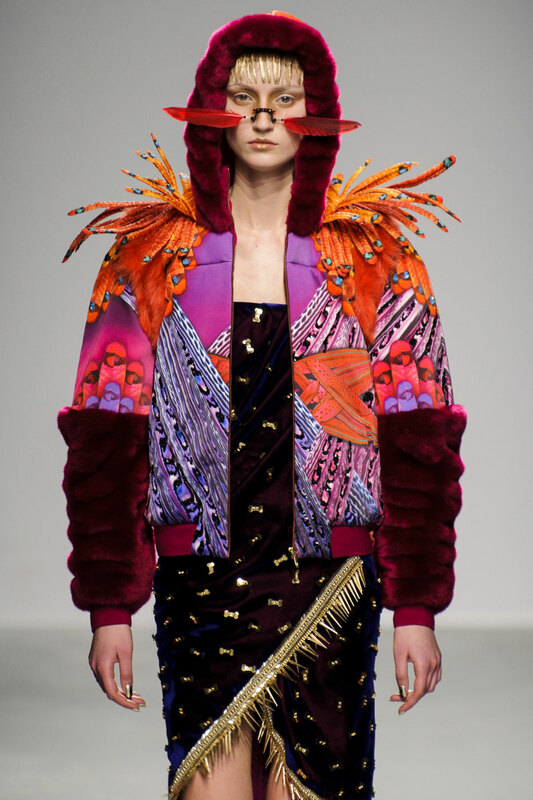 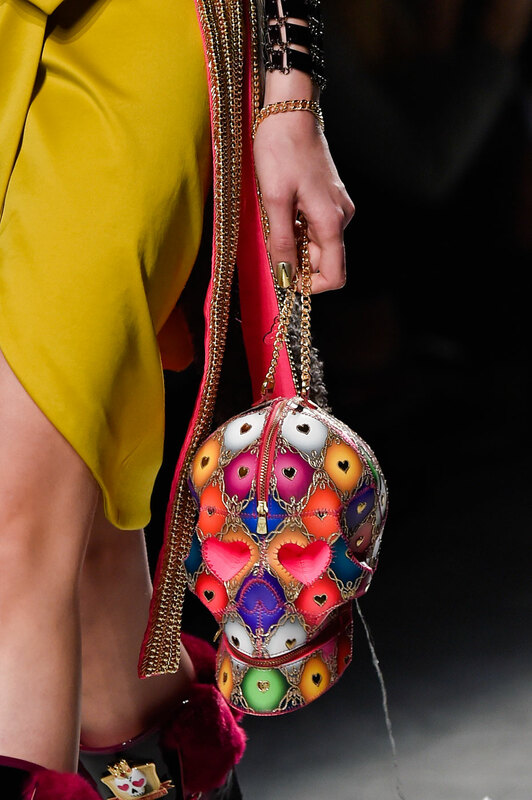 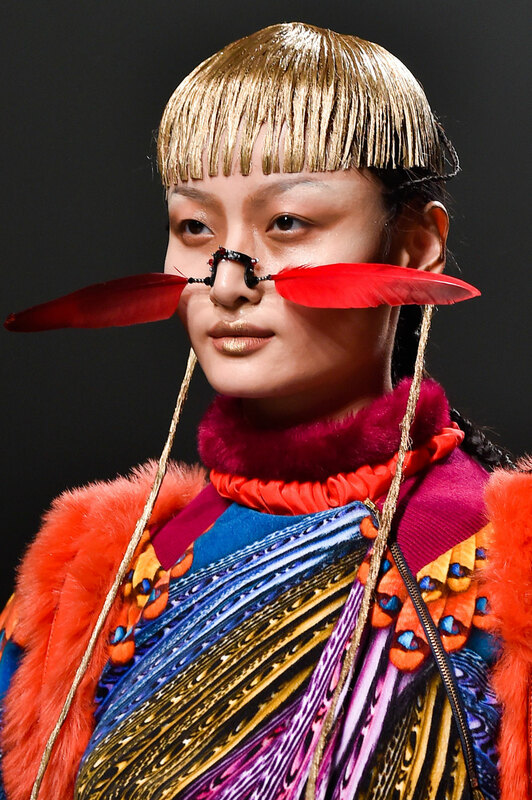 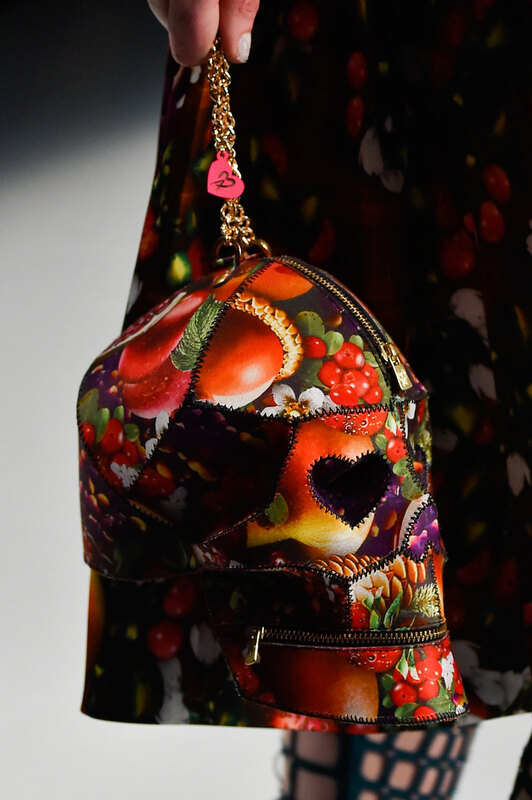 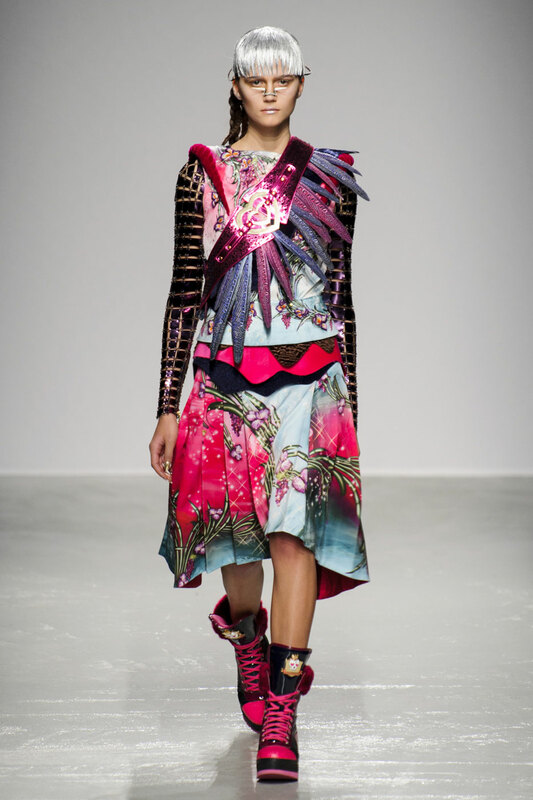 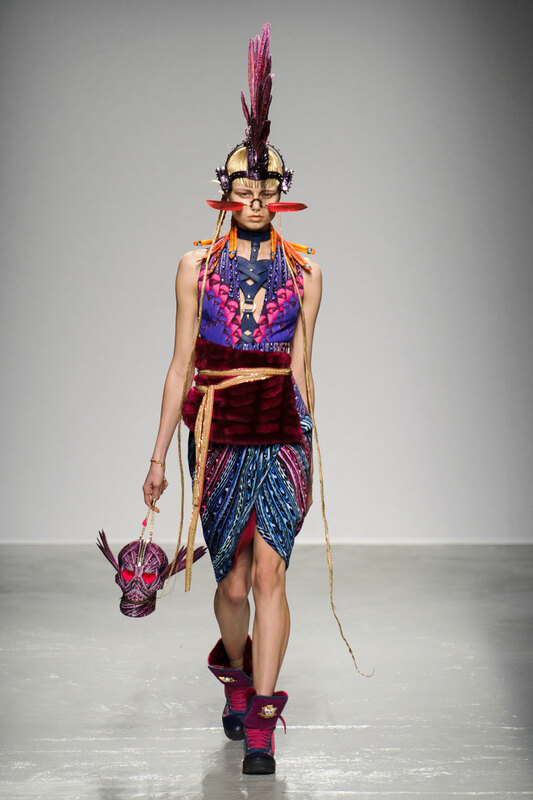 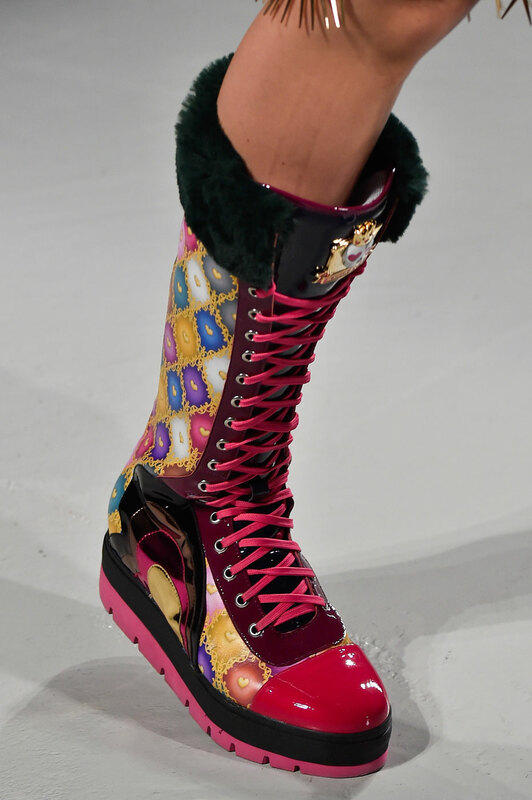 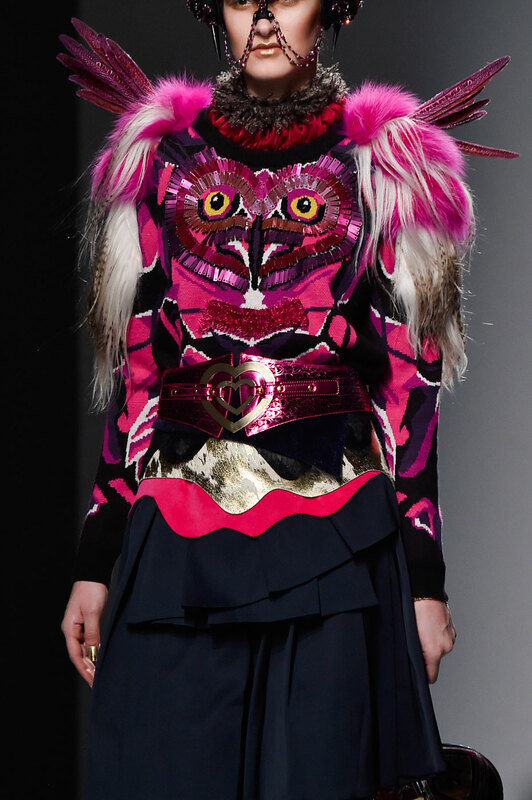 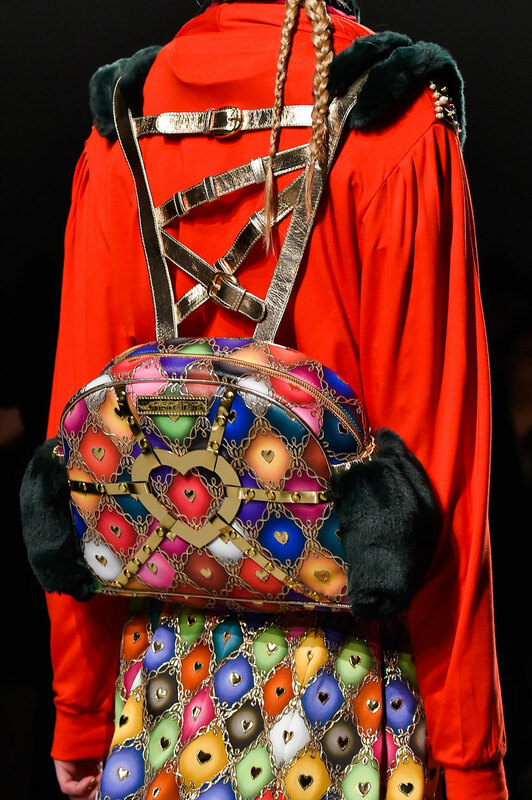 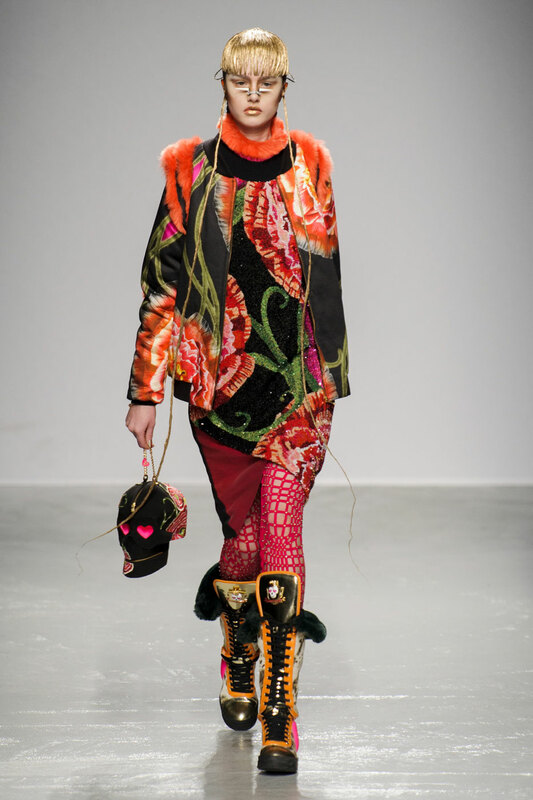 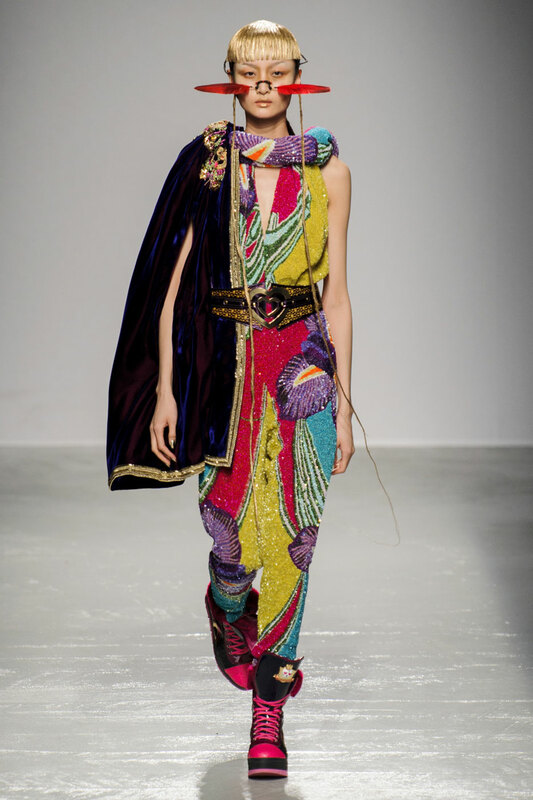 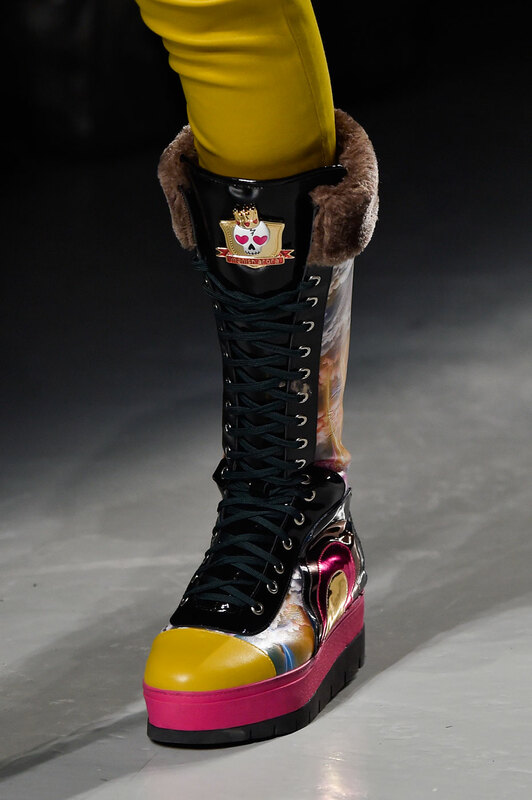 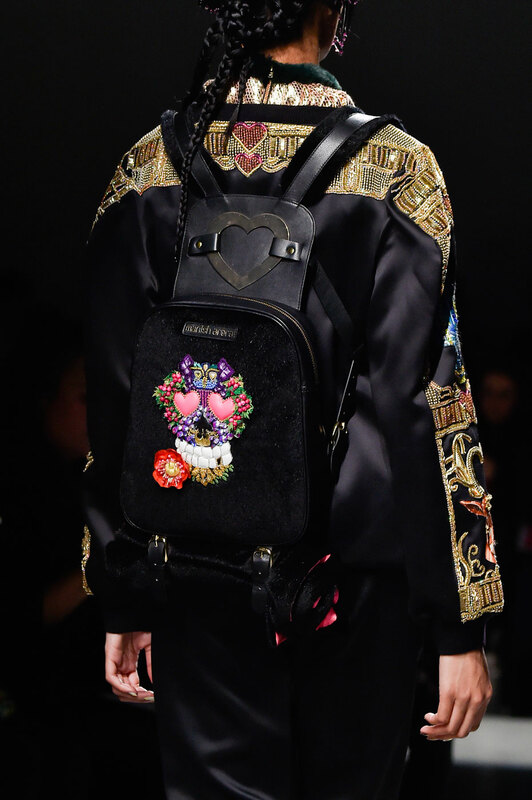 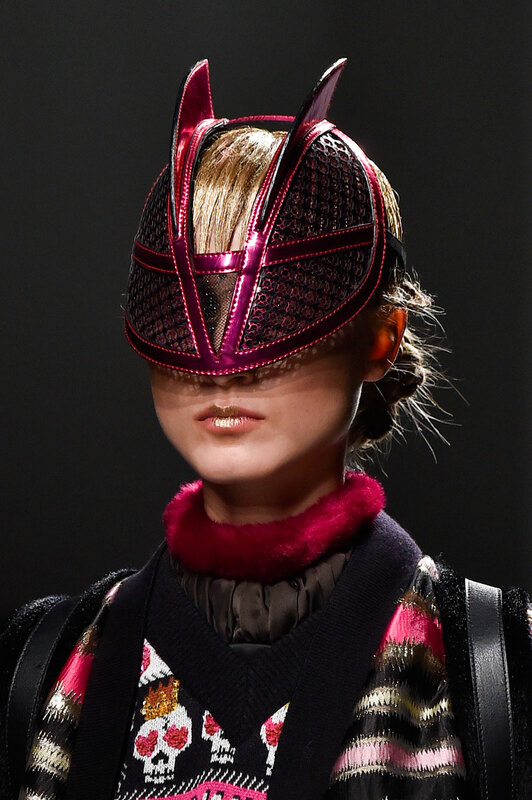 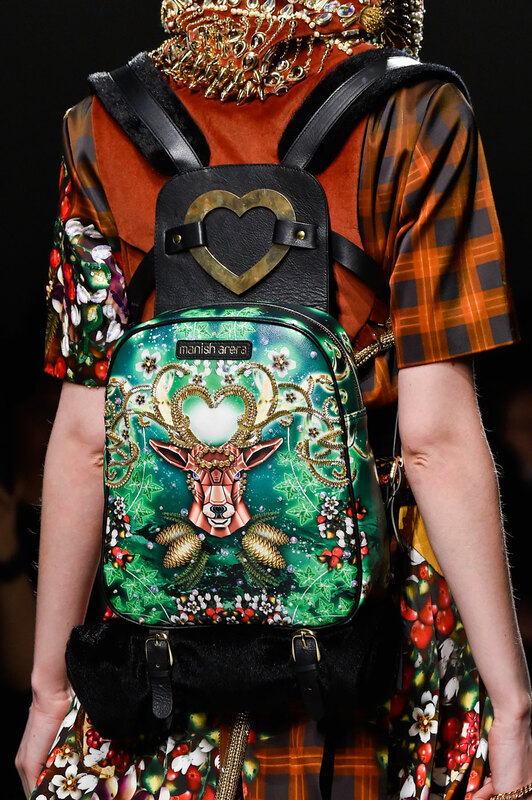 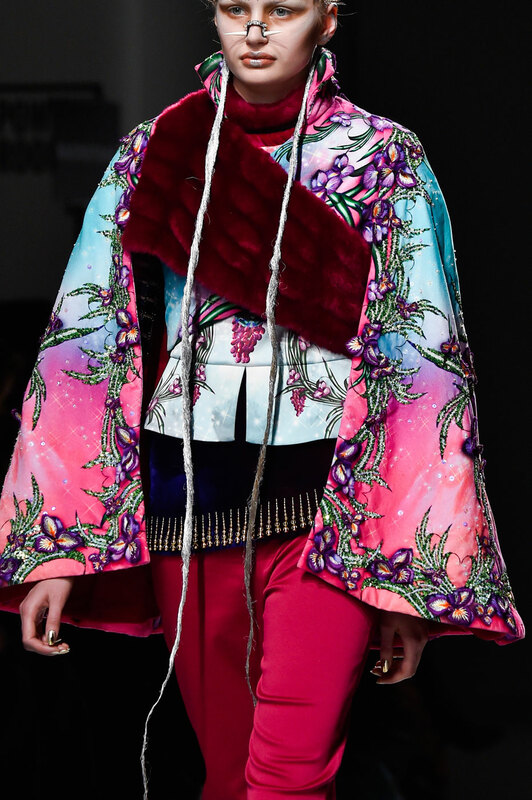 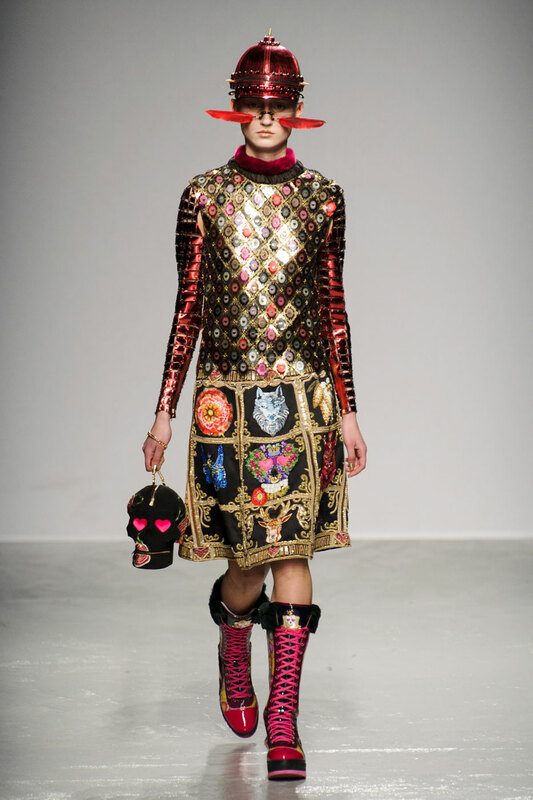 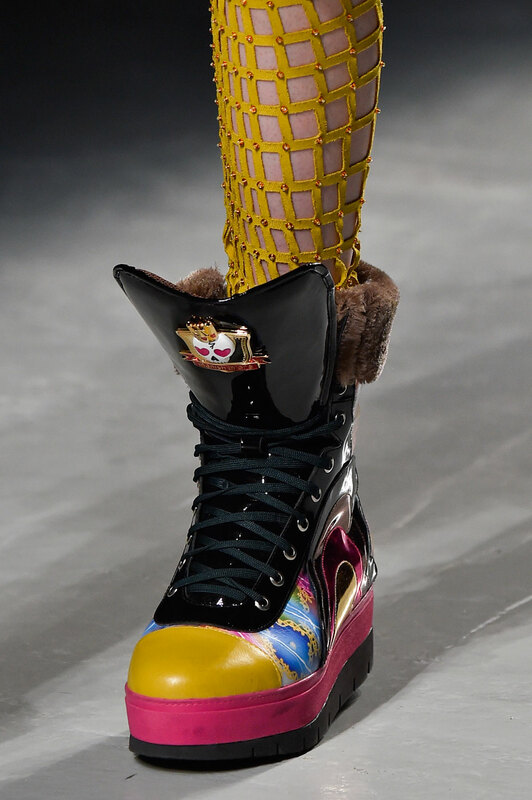 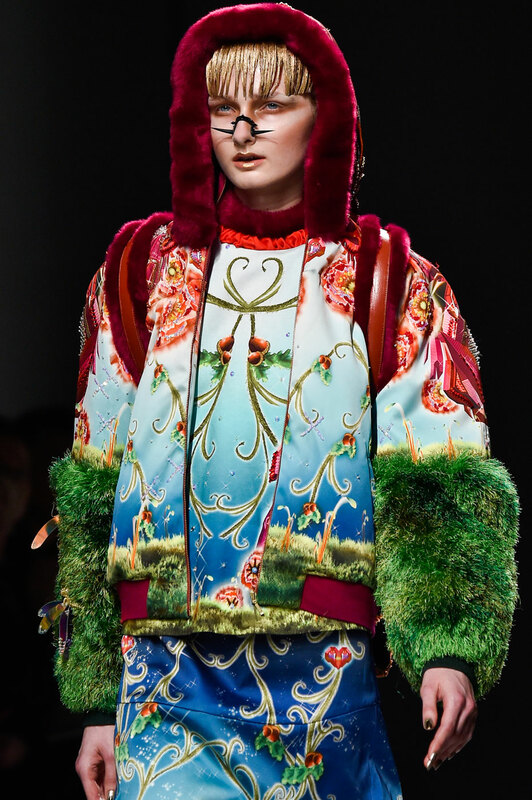 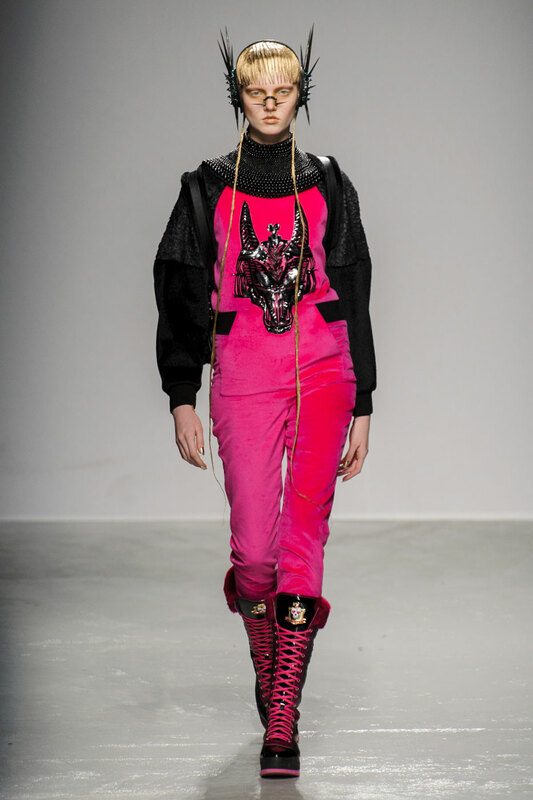 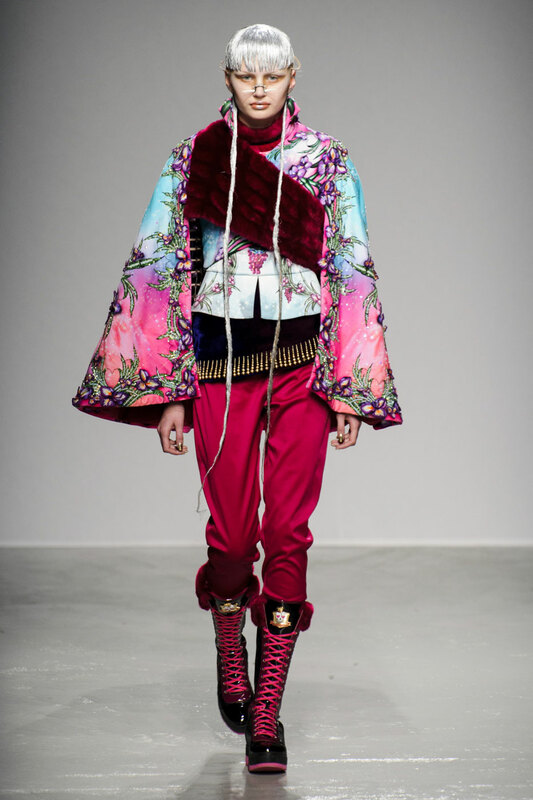 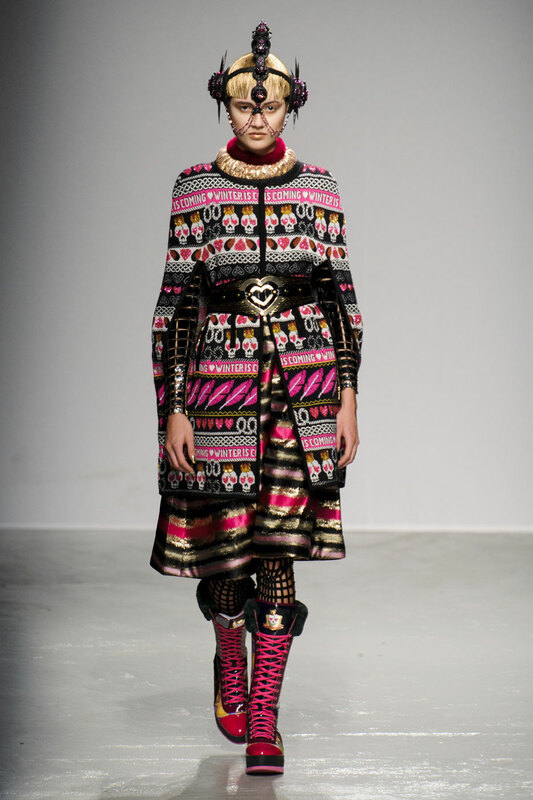 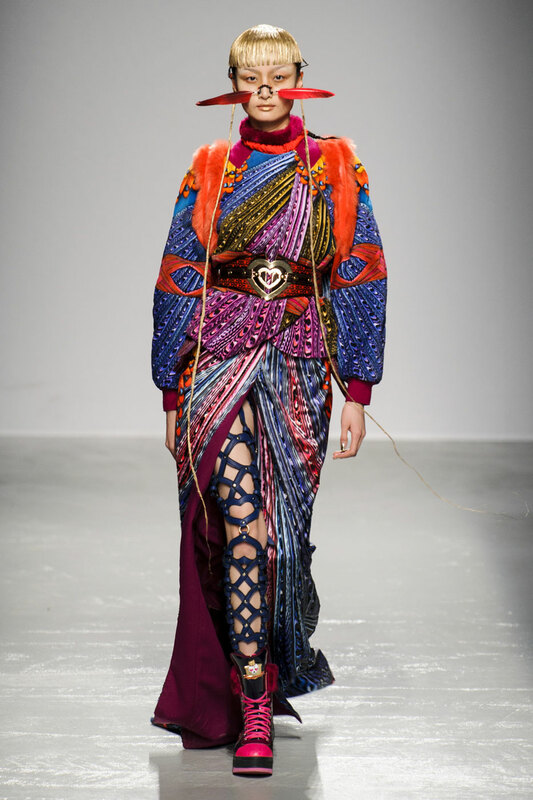 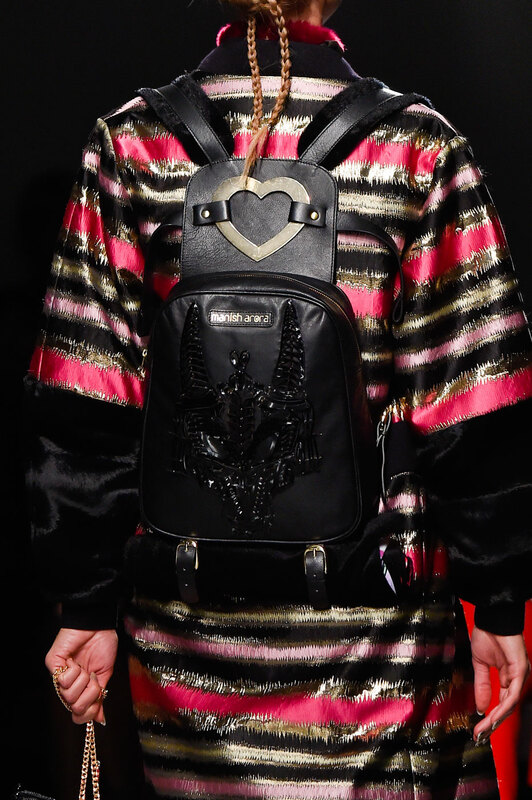 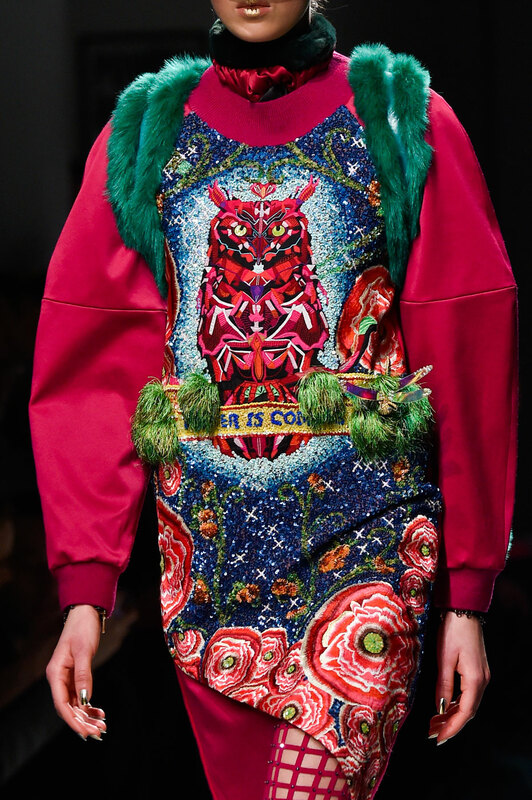 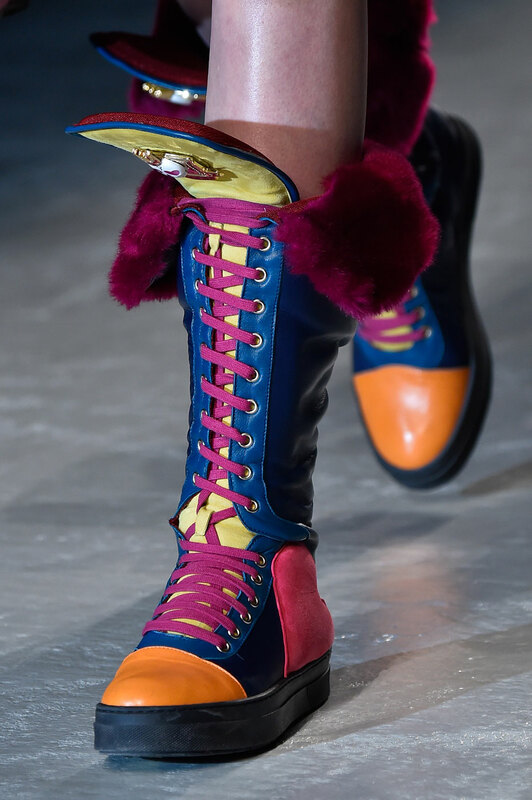 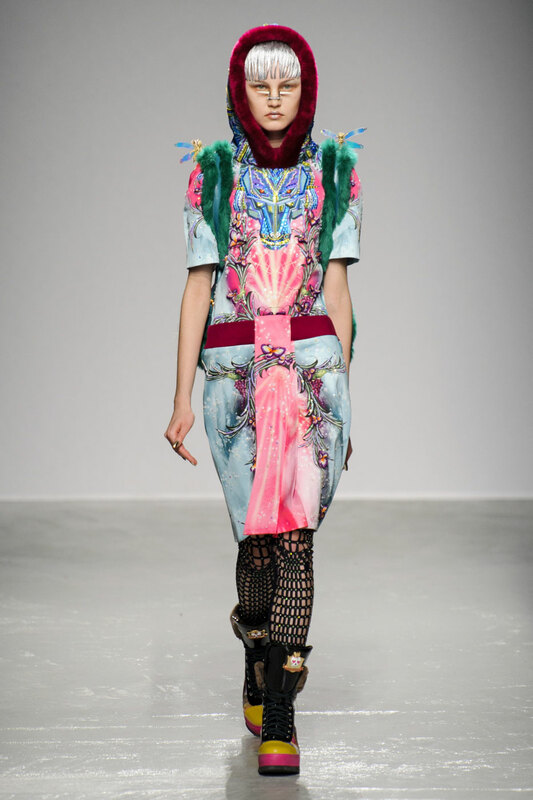 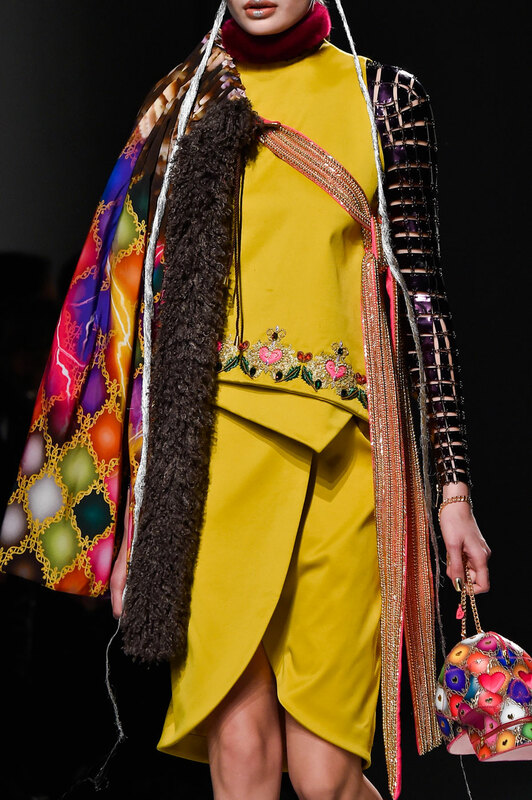 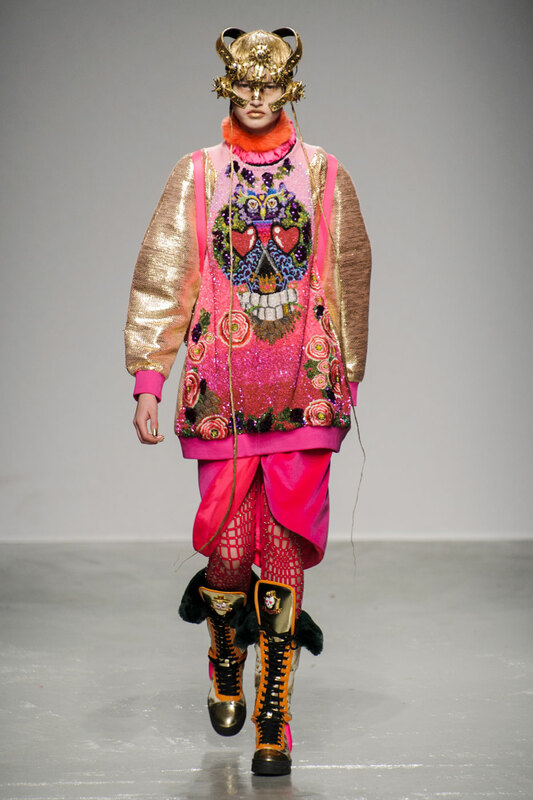 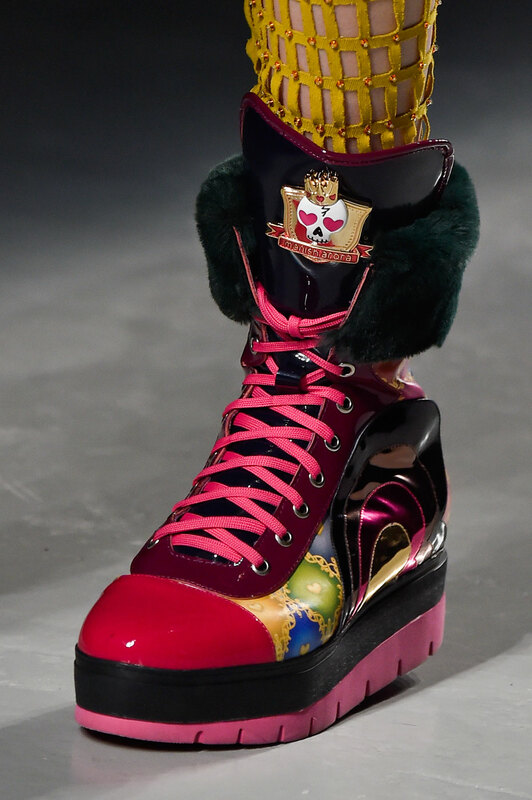 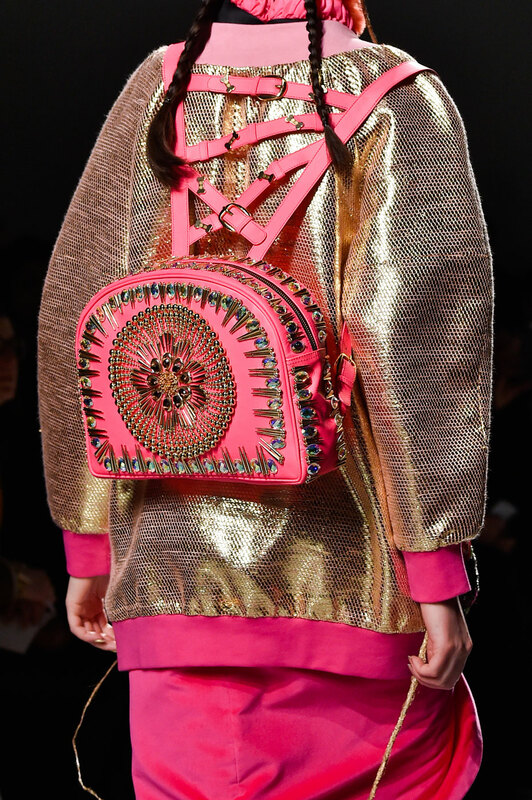 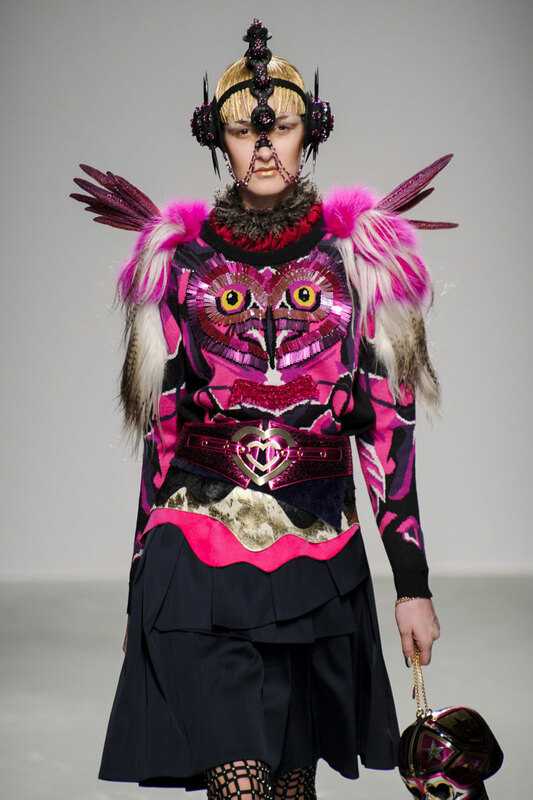 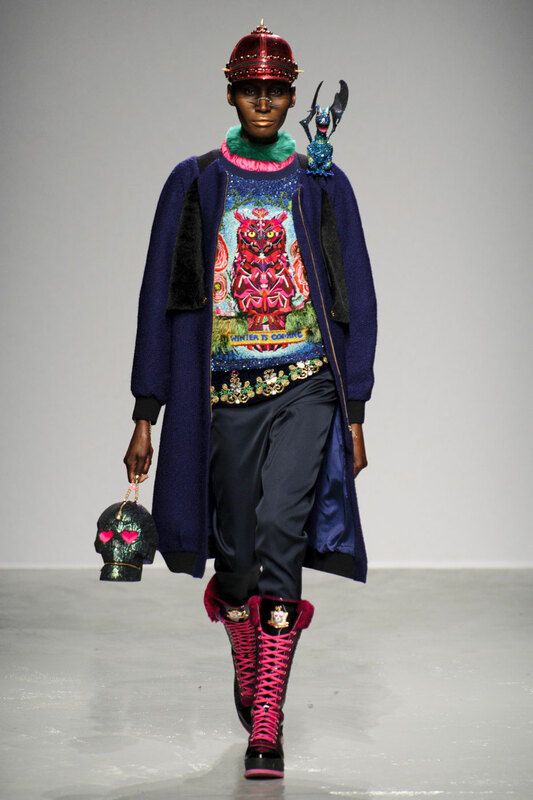 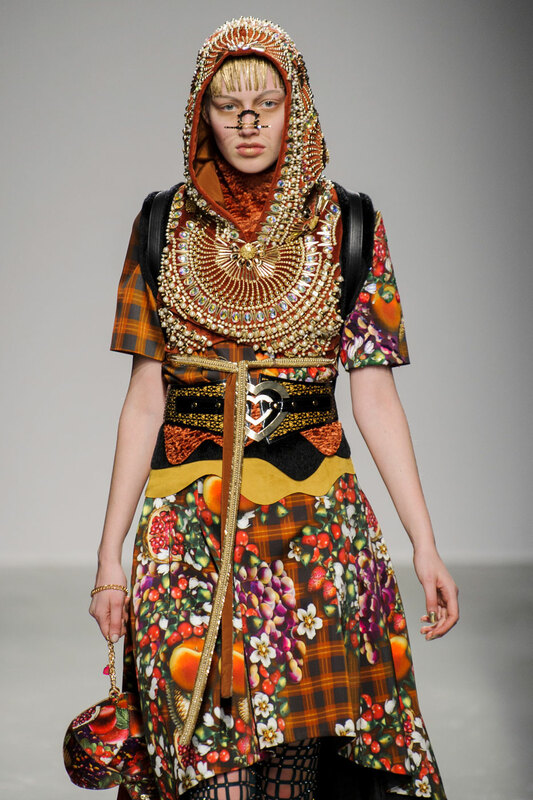 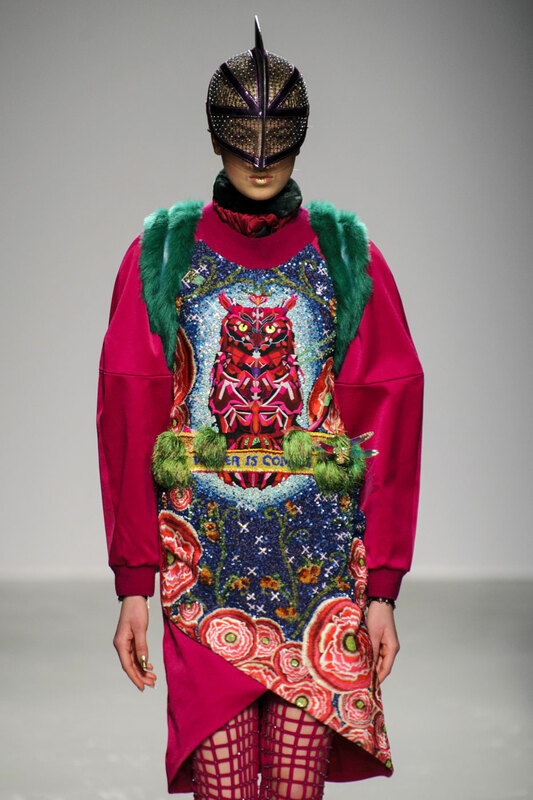 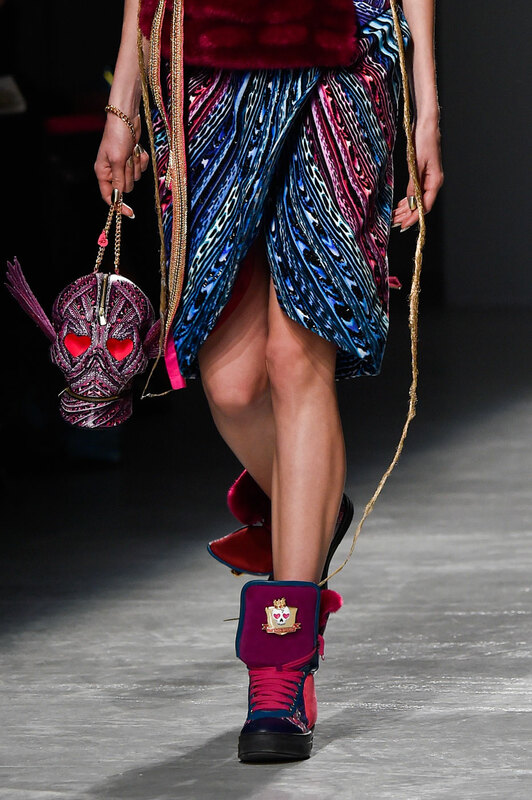 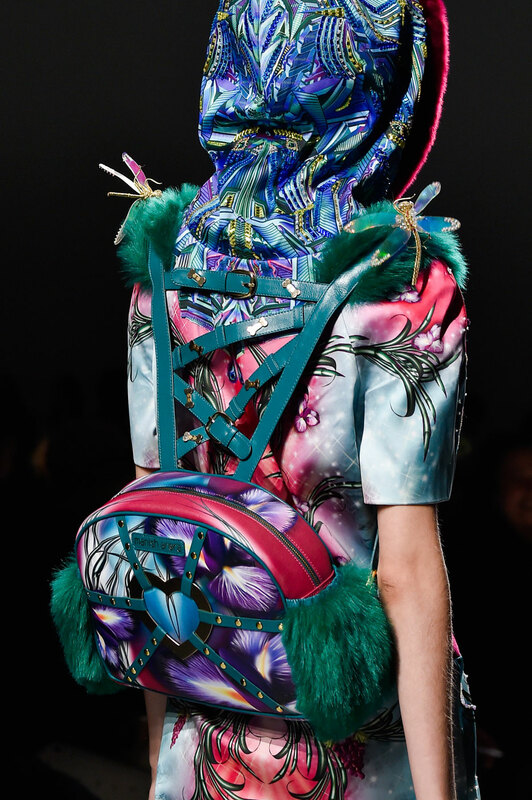 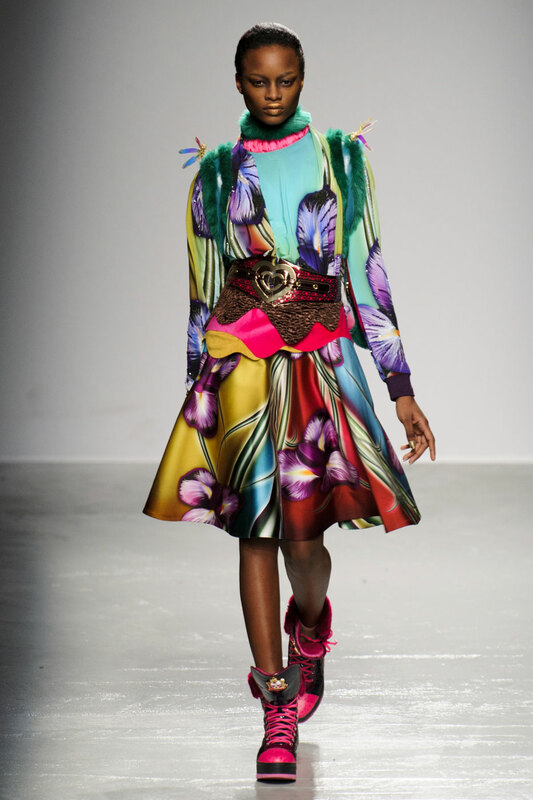 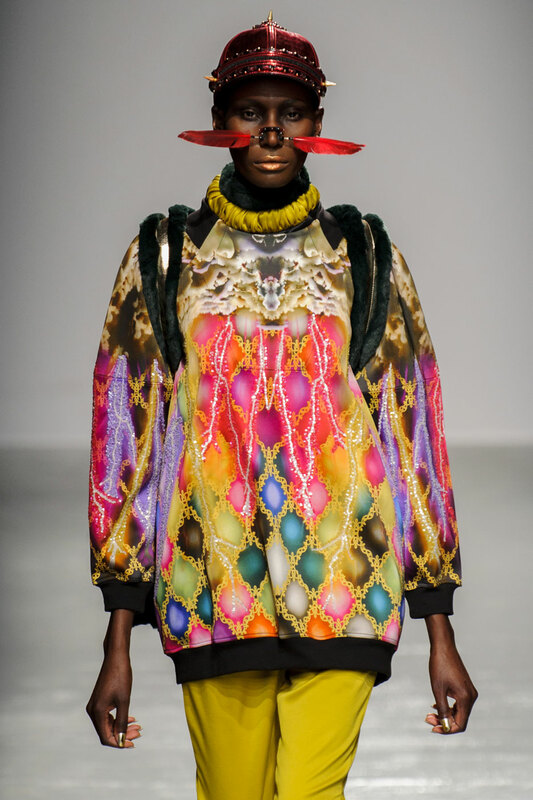 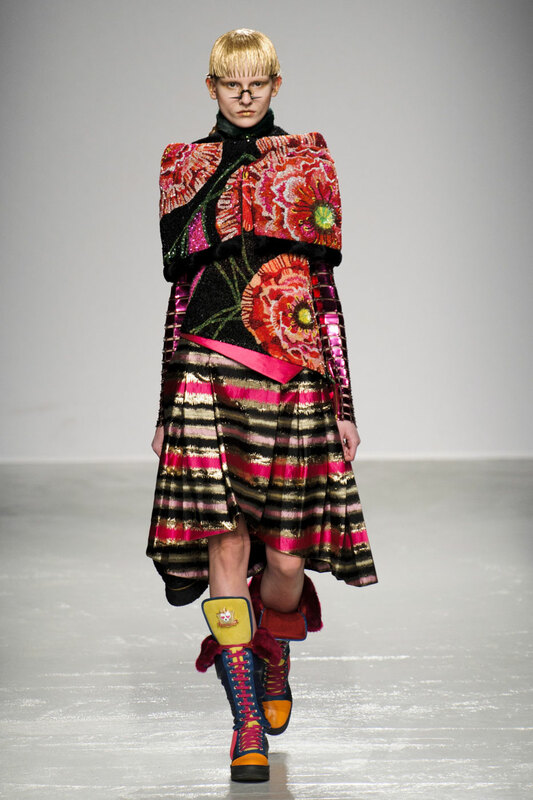 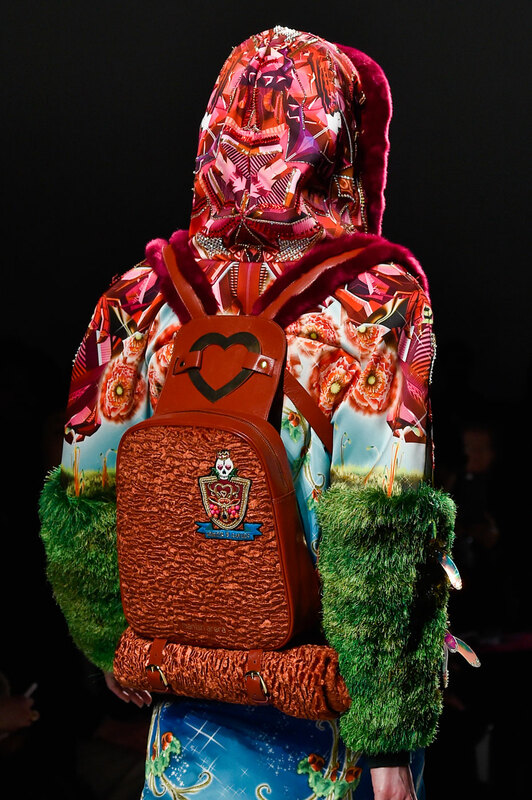 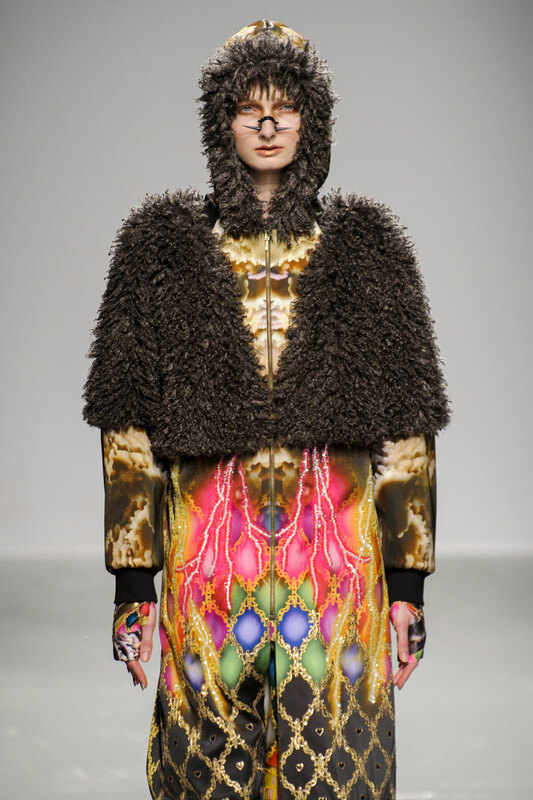 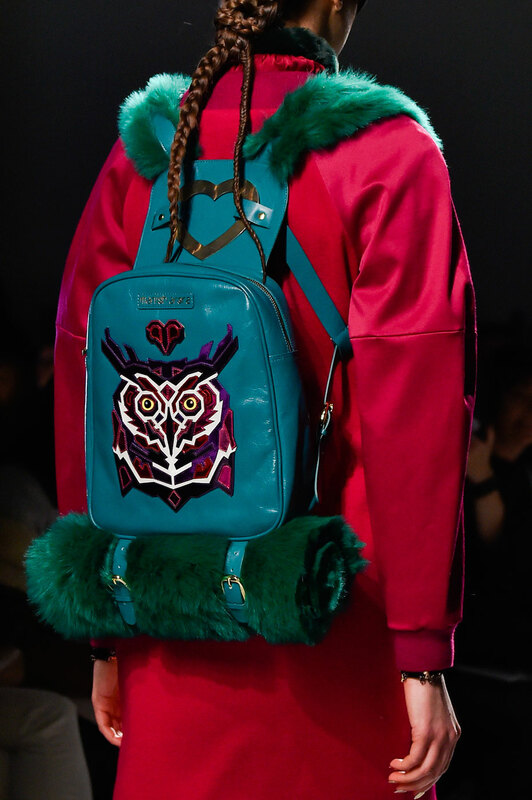 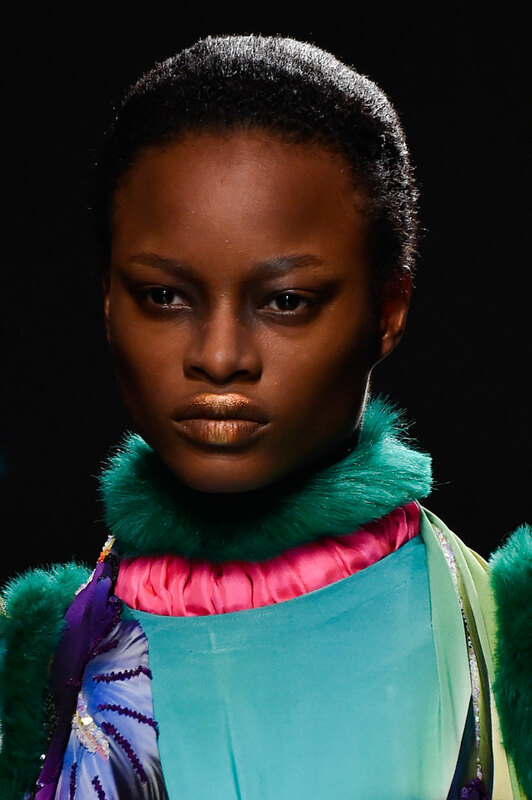 Manish Arora Women Autumn-Winter 2015 – You never know what to expect with Manish Arora’s eponymous label, with his innovative ideas you can never predict his next move. 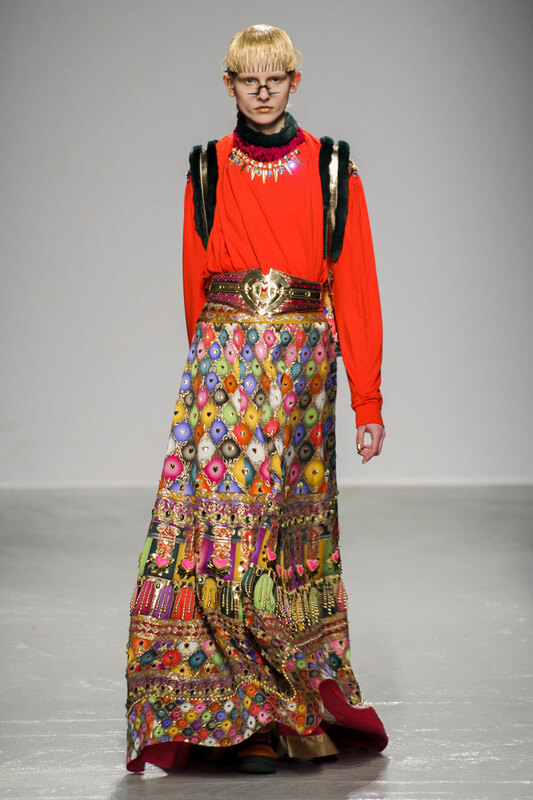 But what you can always count on Arora for, is colour. 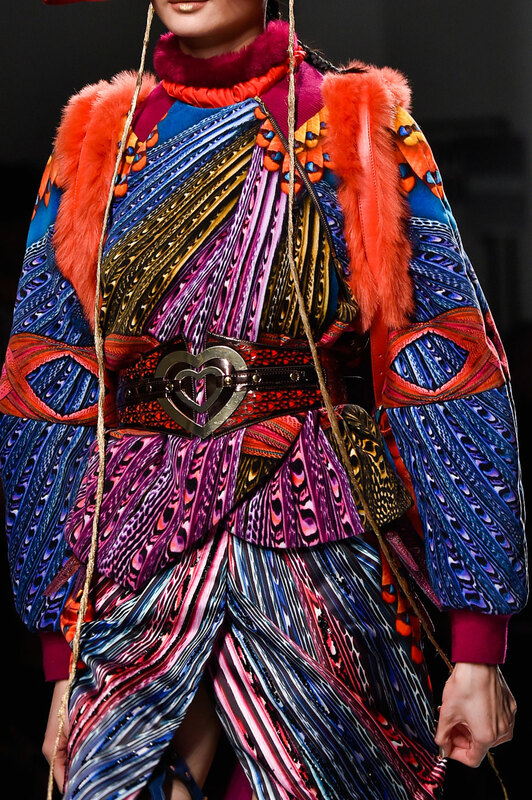 Colours that are so in your face, you can’t help but love it. 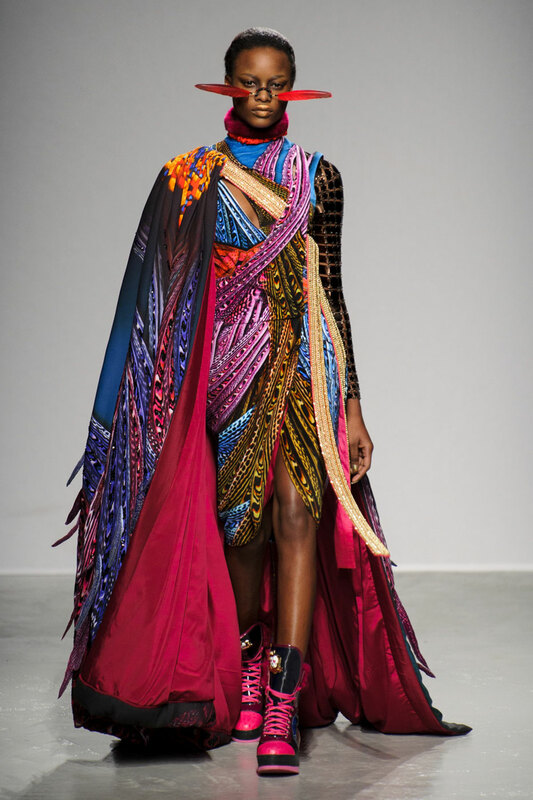 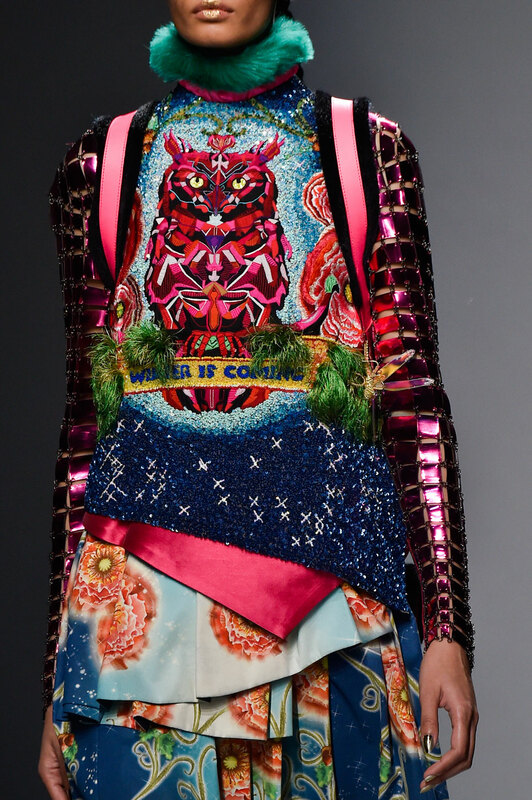 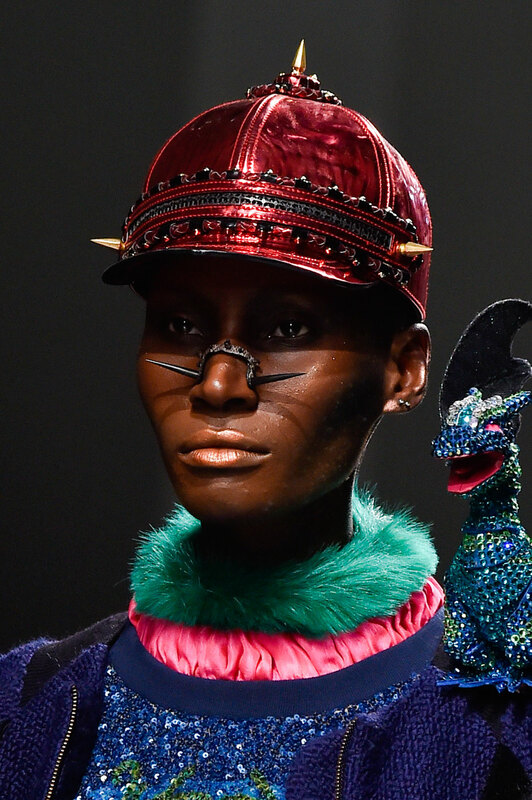 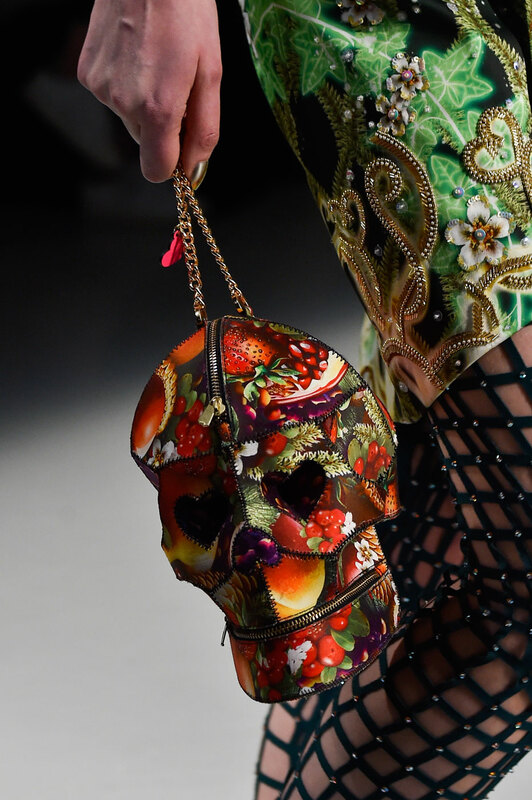 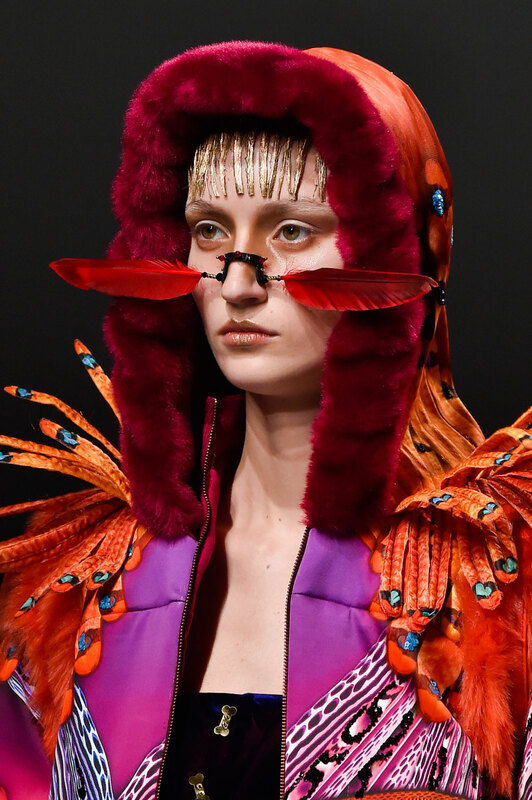 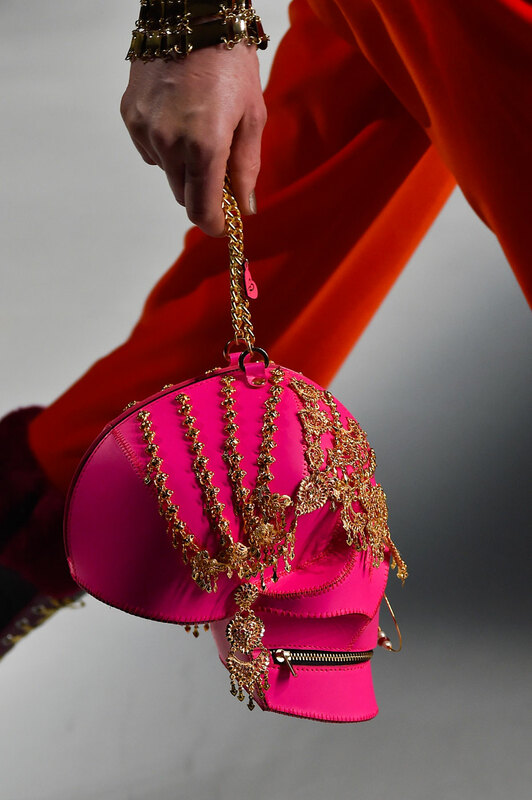 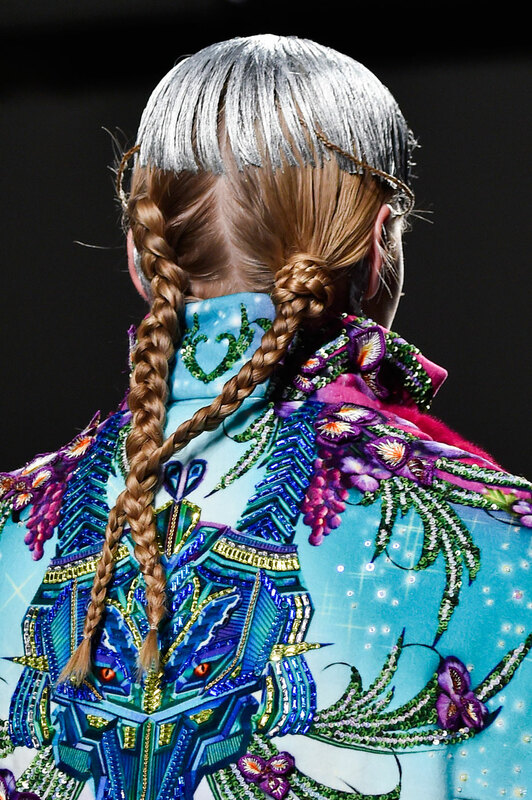 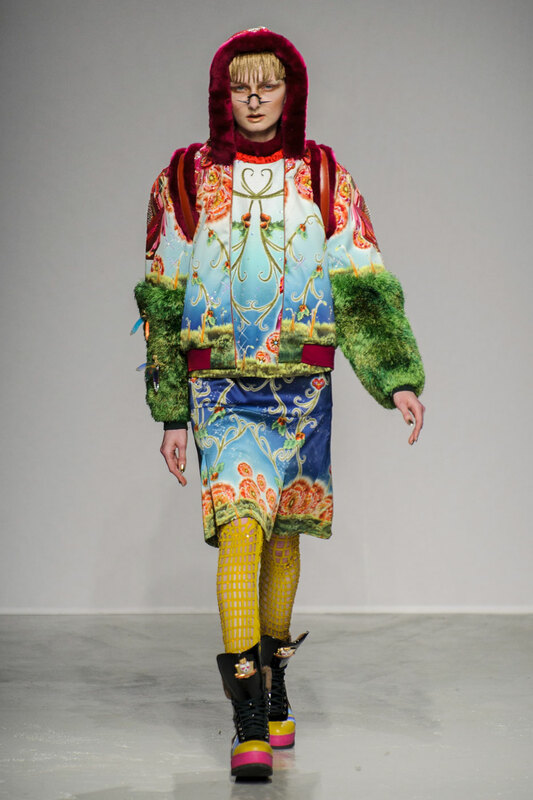 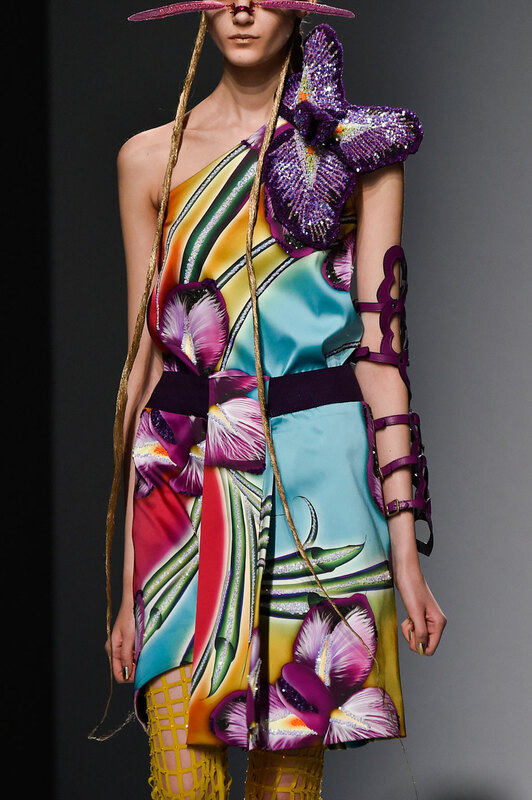 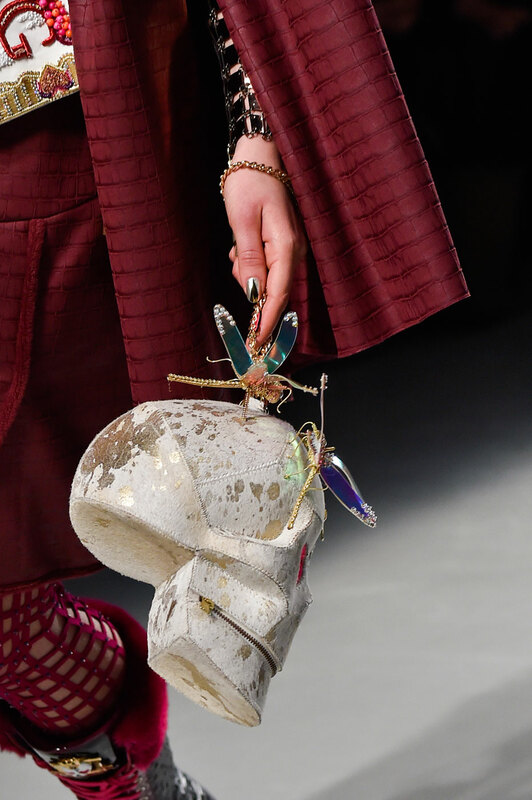 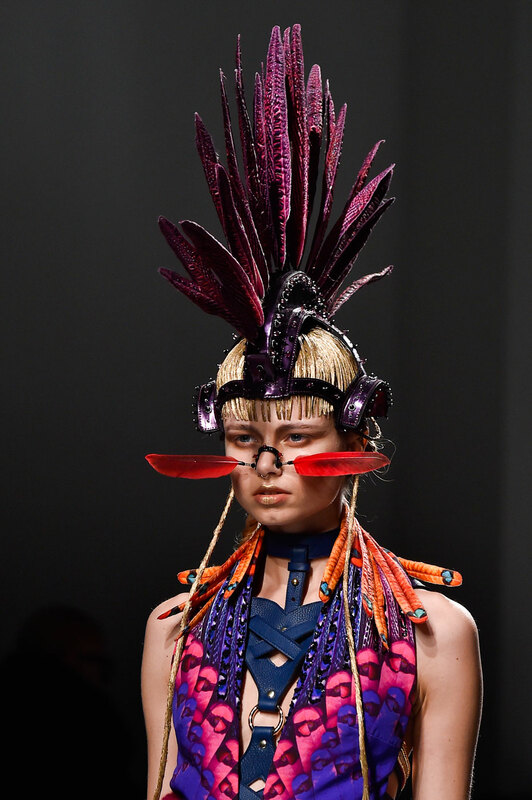 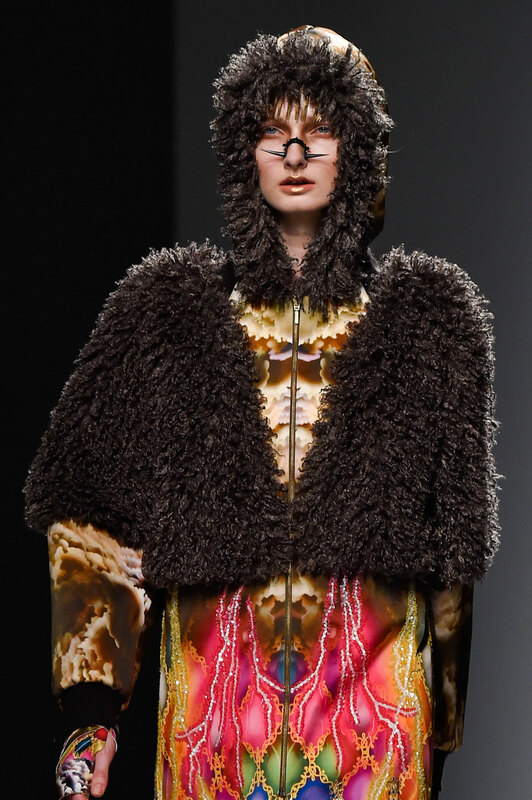 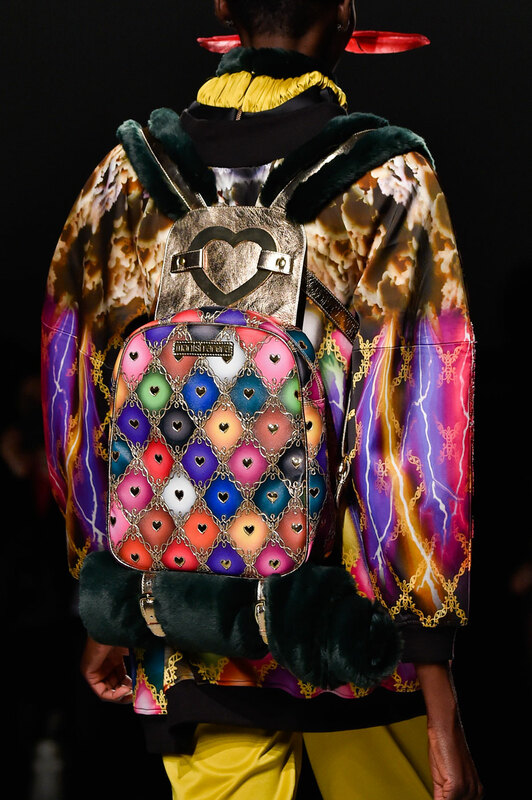 In his most ambitious and eccentric collection yet, the maximalist imagined a clan of “fierce warriors” adorned in enough colour dripping kitsch to give you a headache. 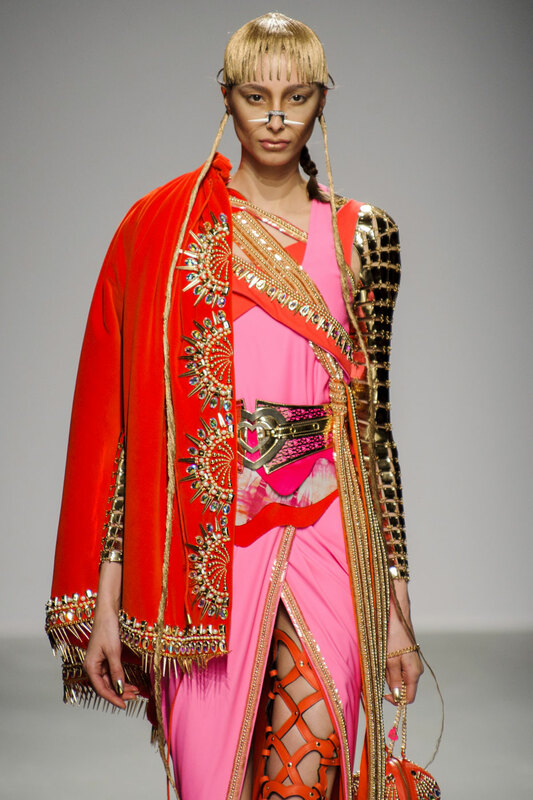 It was a case of East meets West with Arora honing his aesthetic of combining traditional Indian craft like embroidery, applique and beading with Western silhouettes. 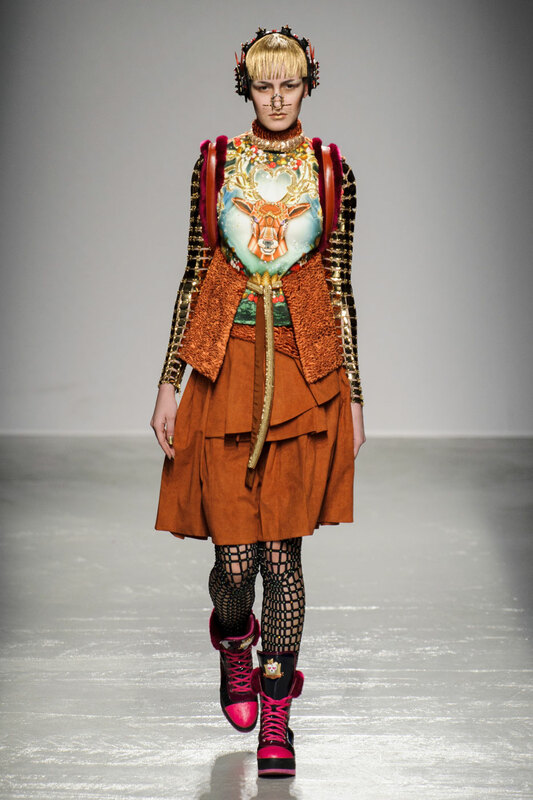 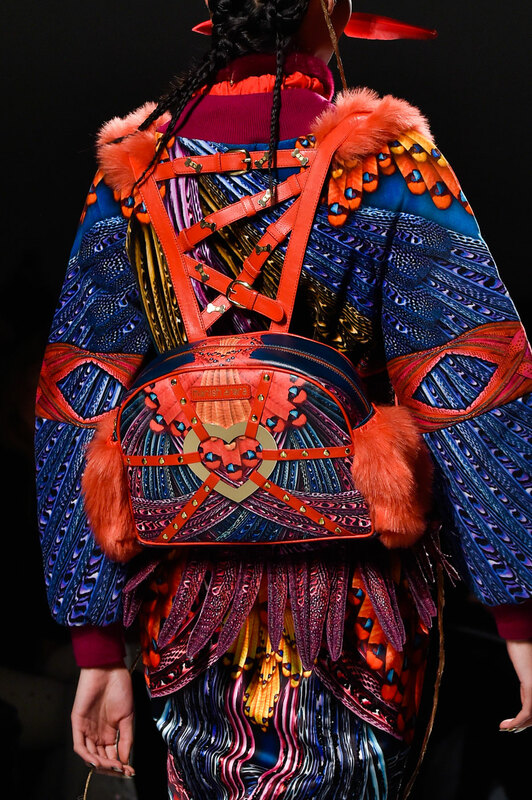 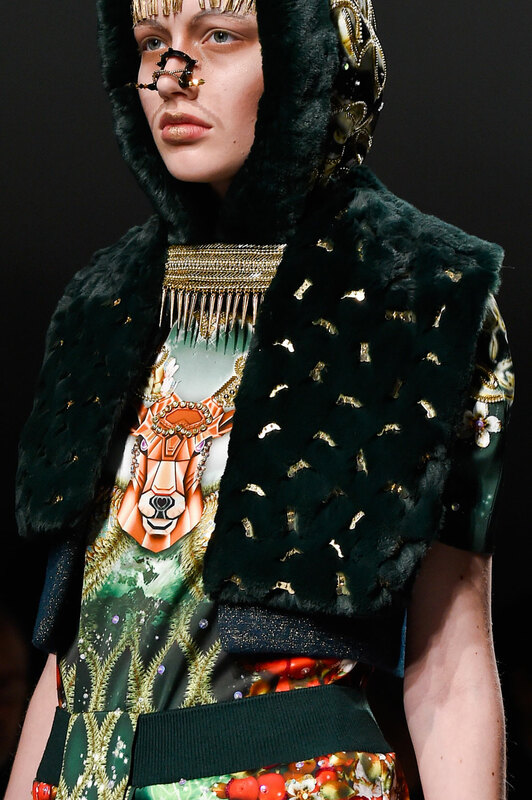 The collection showed astute craftsmanship, Indian heritage with a contemporary vibe. 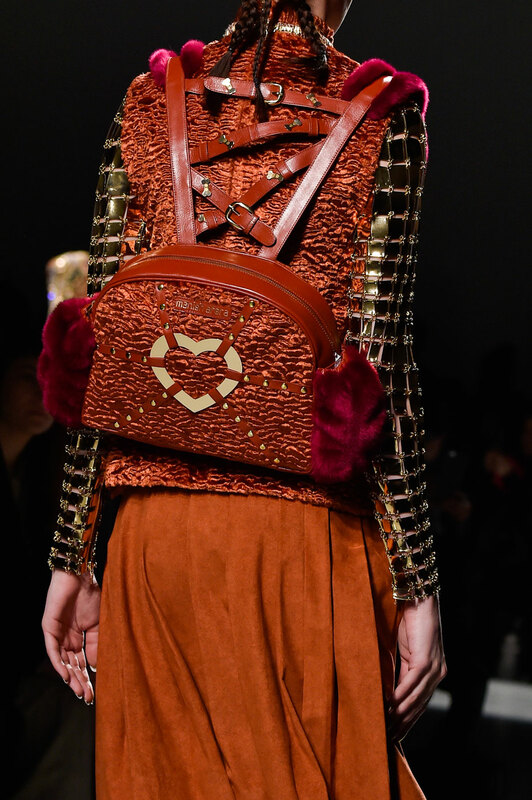 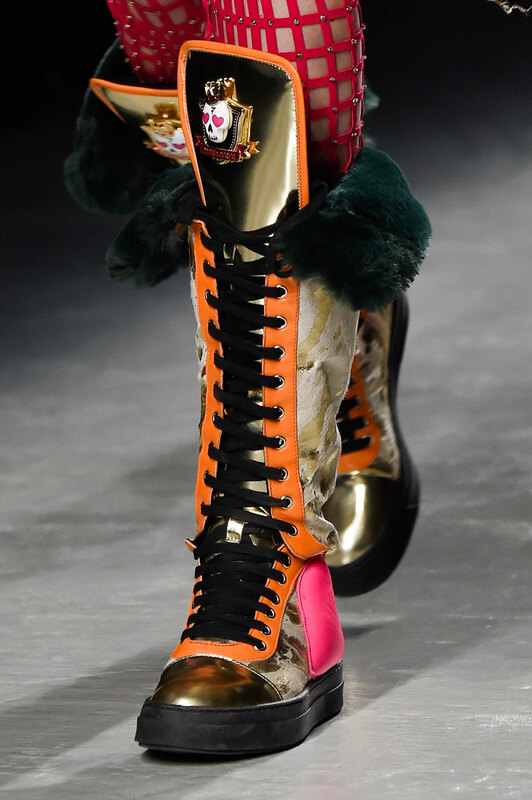 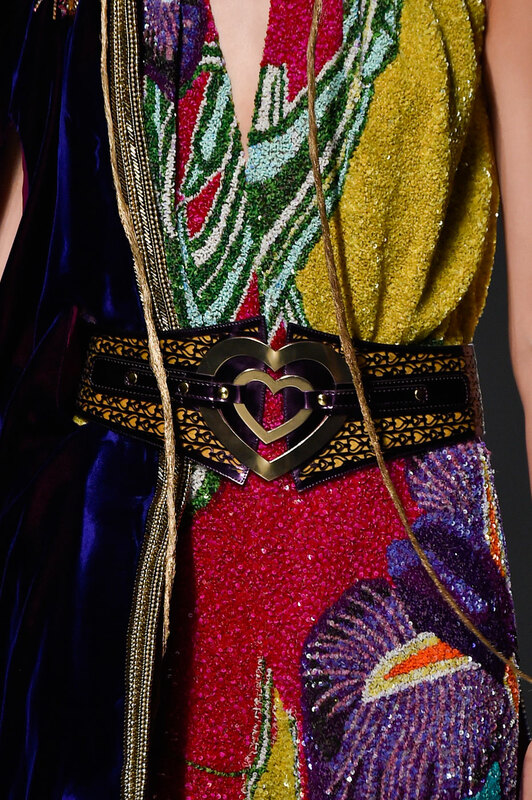 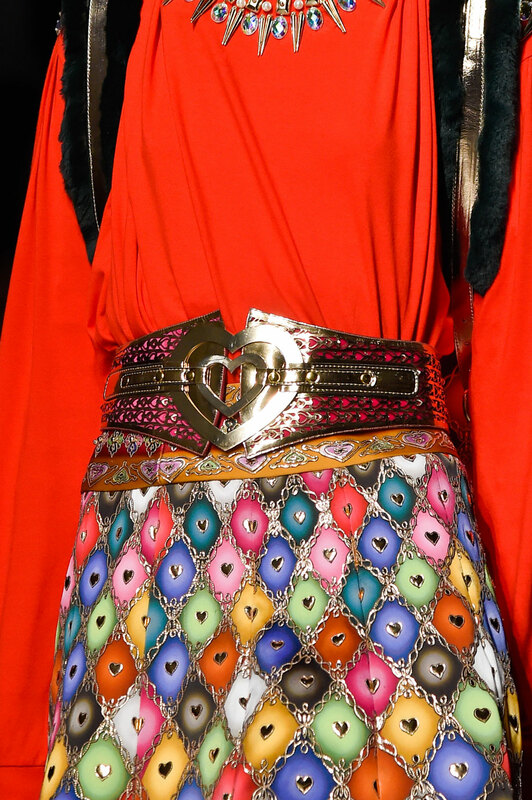 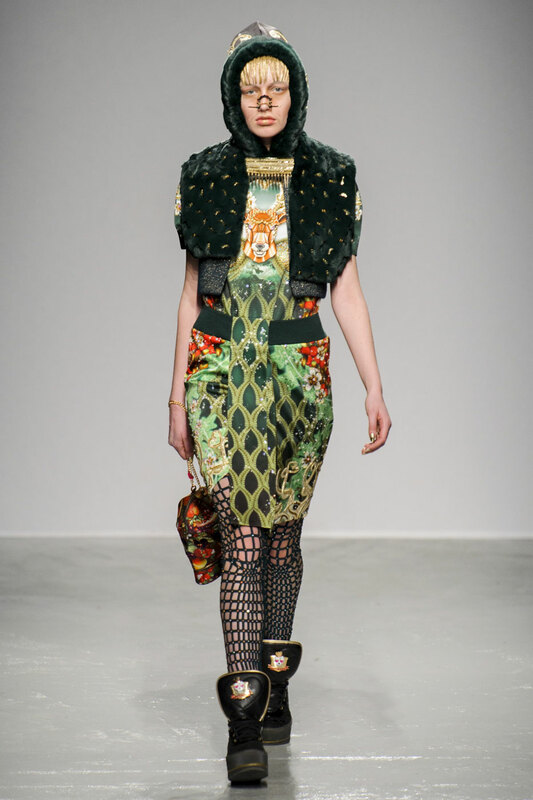 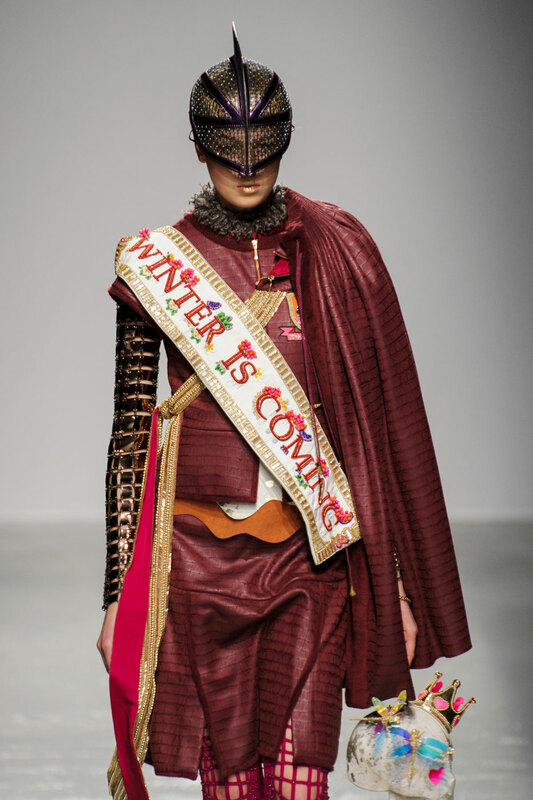 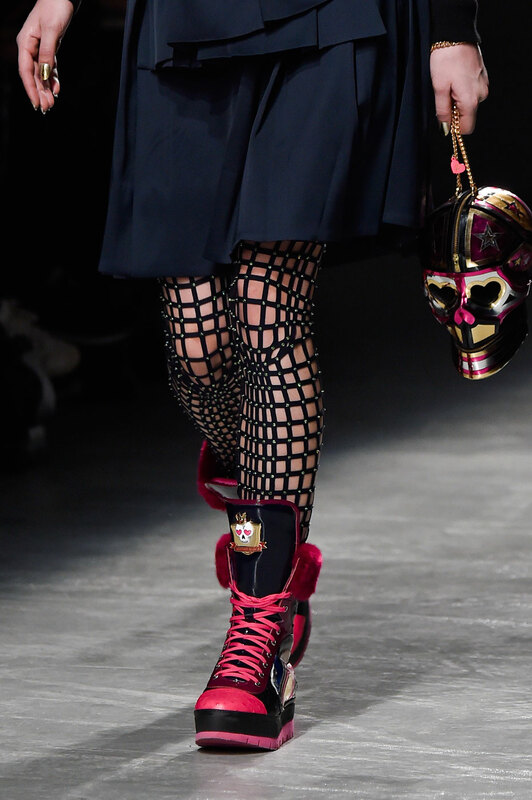 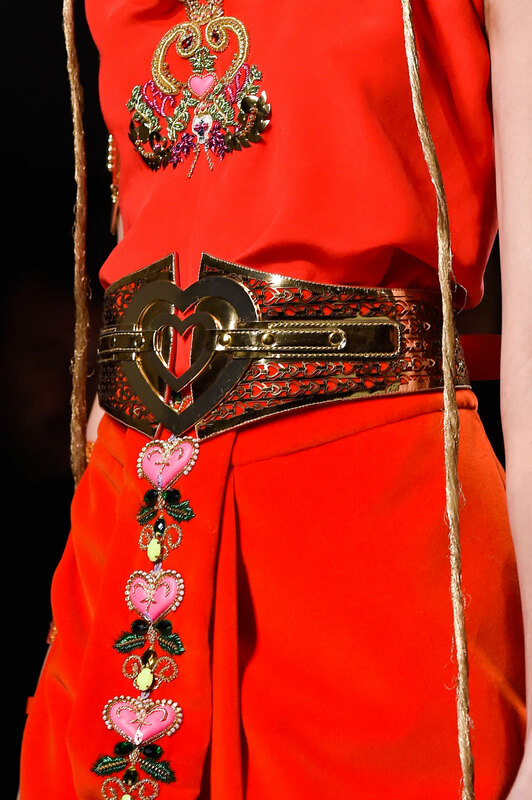 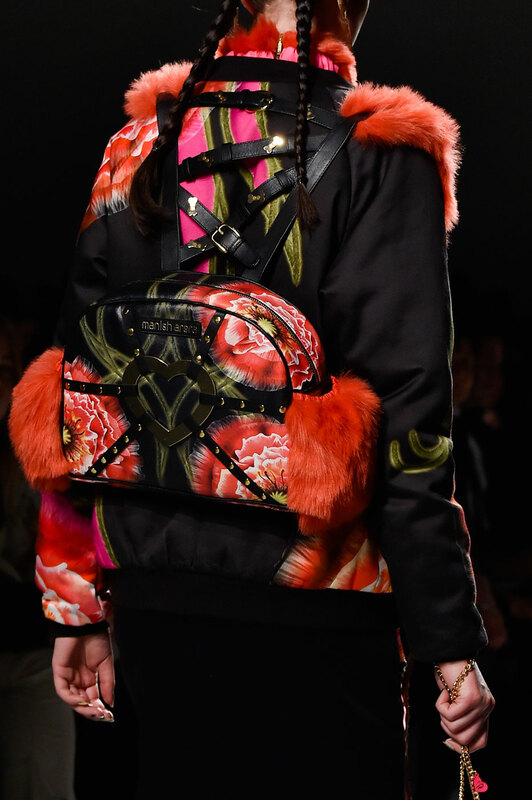 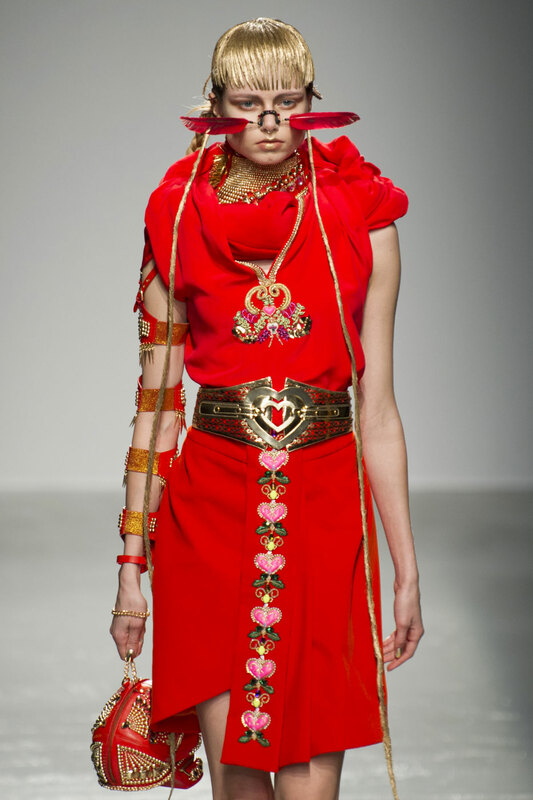 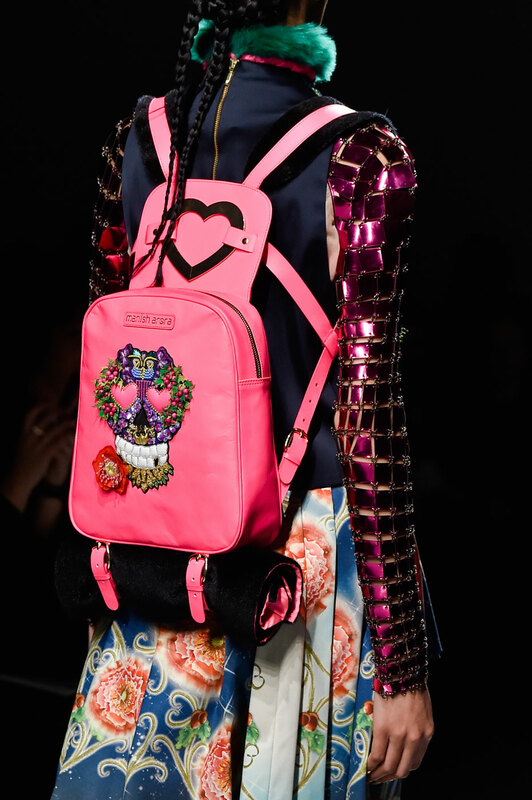 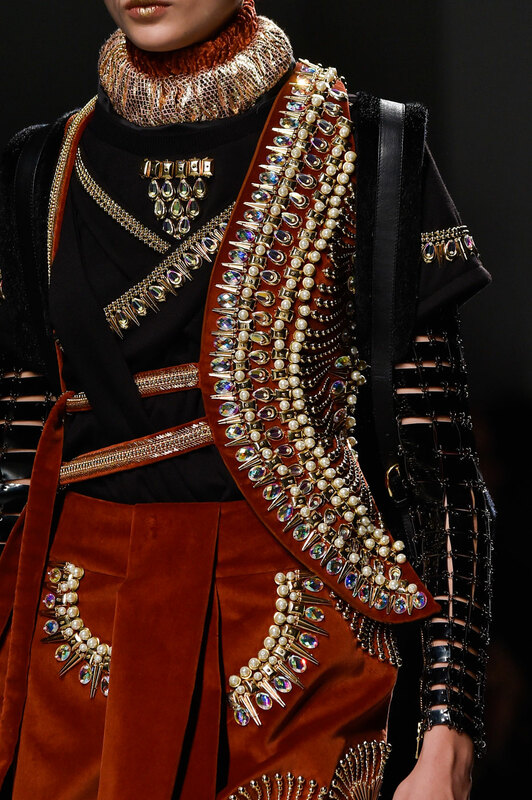 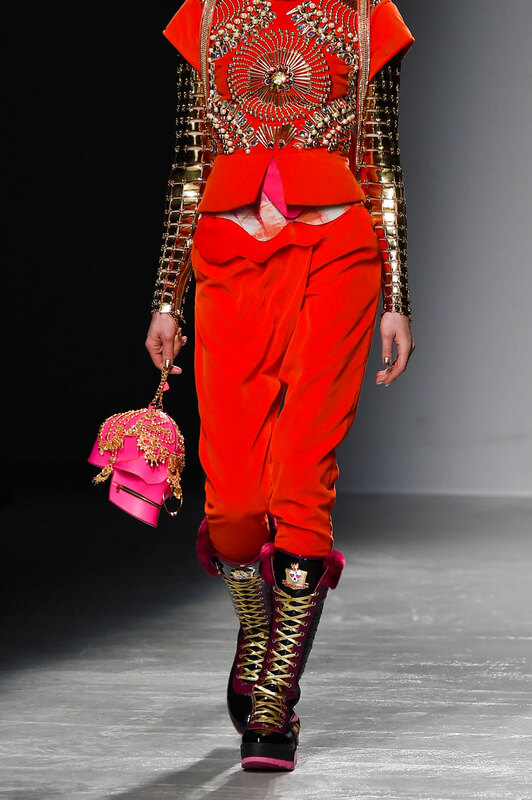 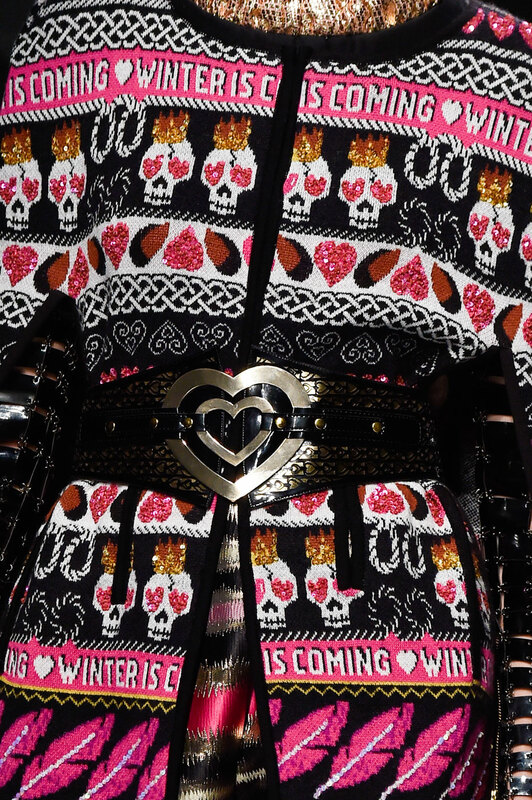 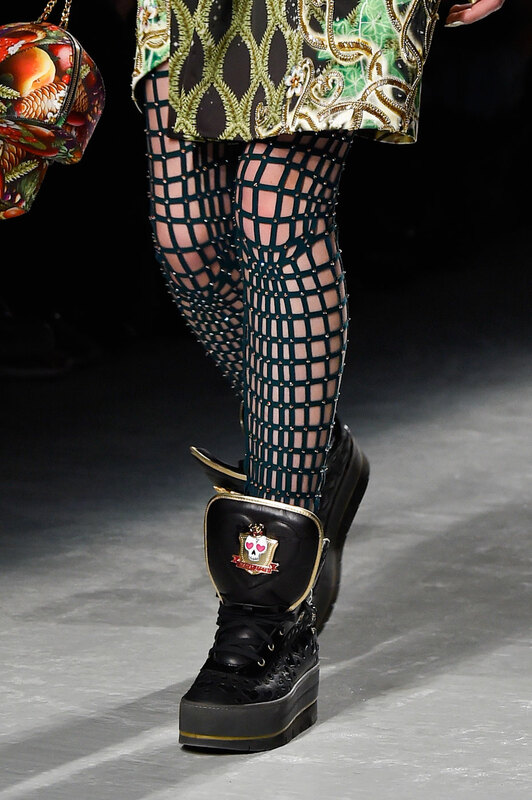 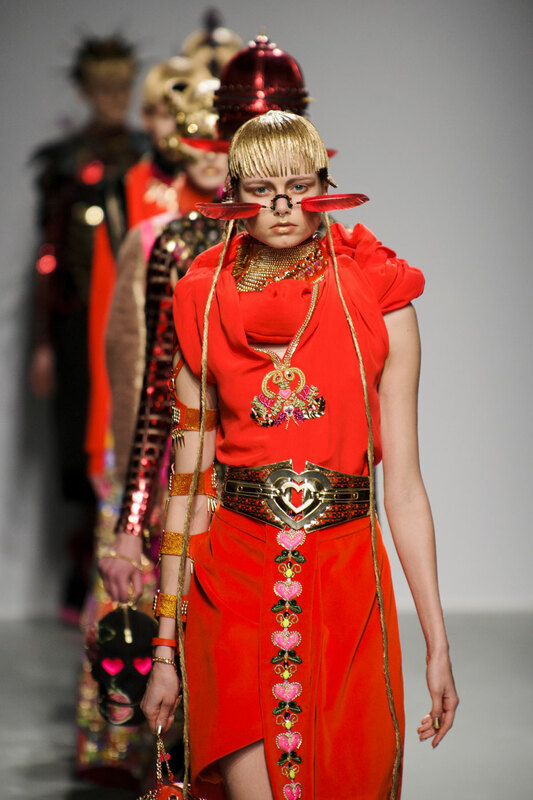 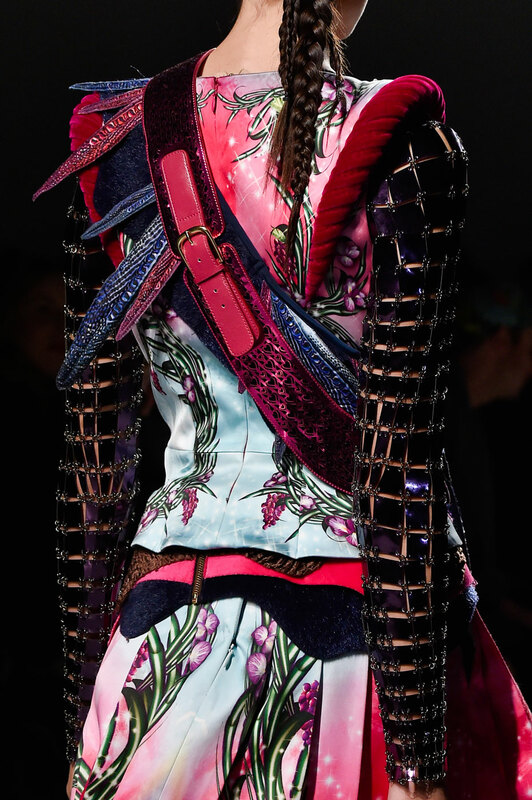 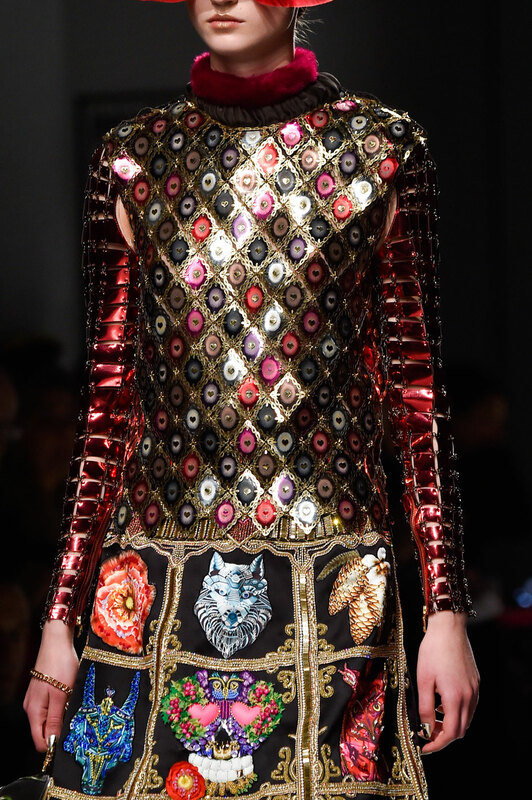 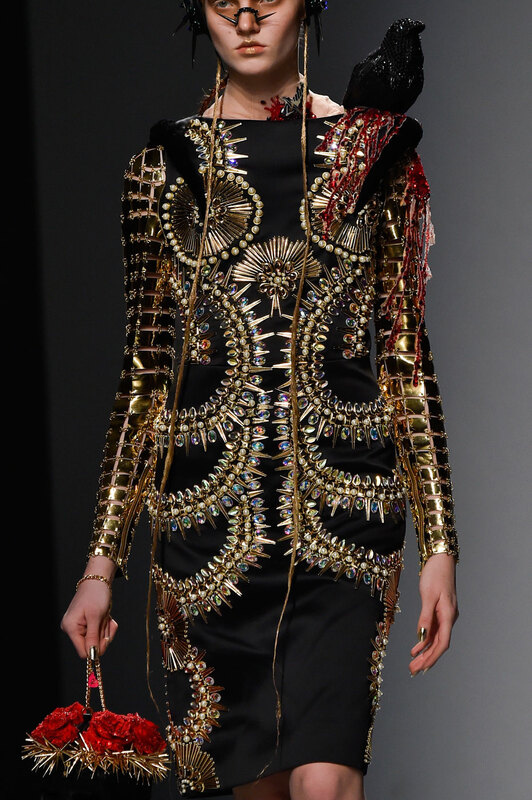 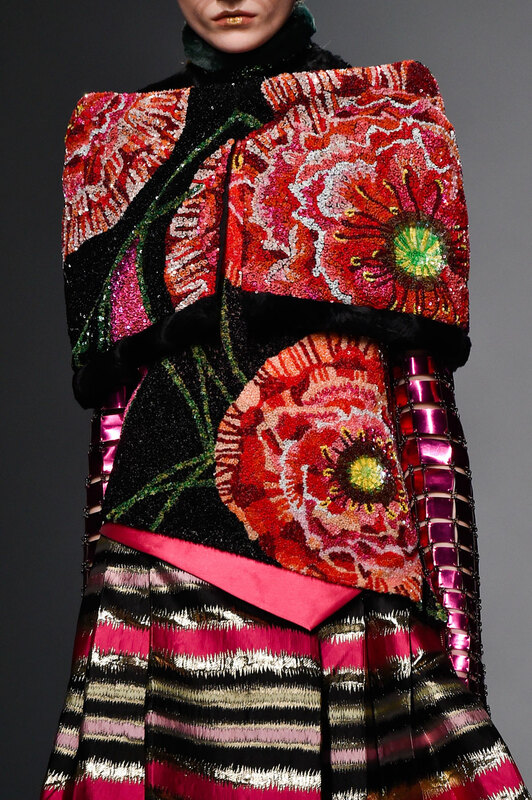 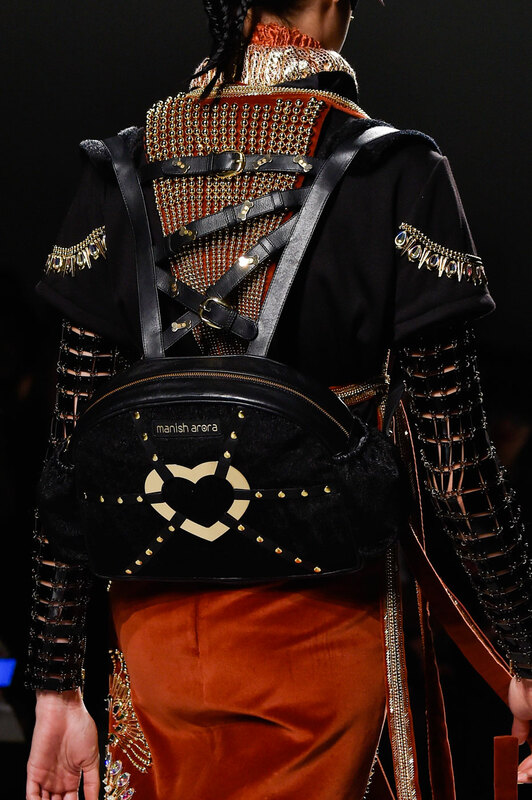 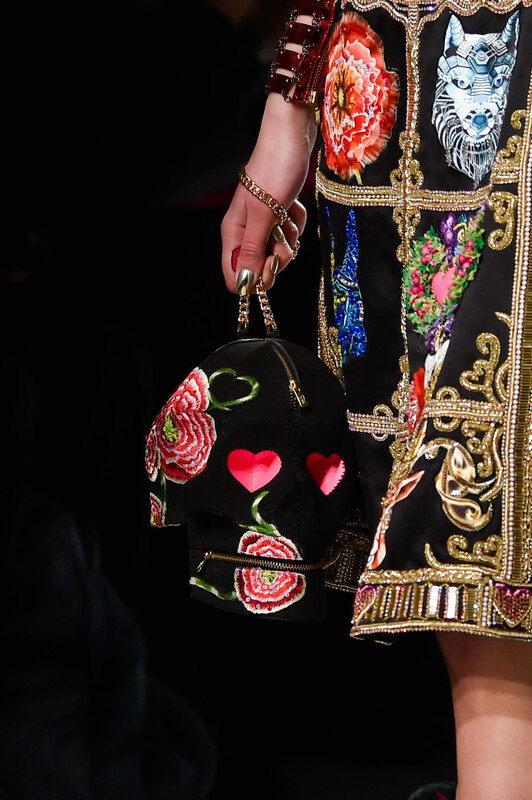 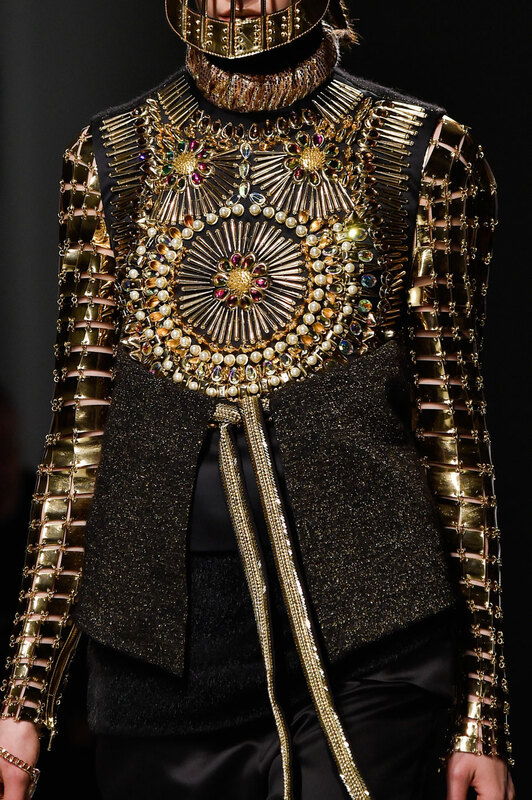 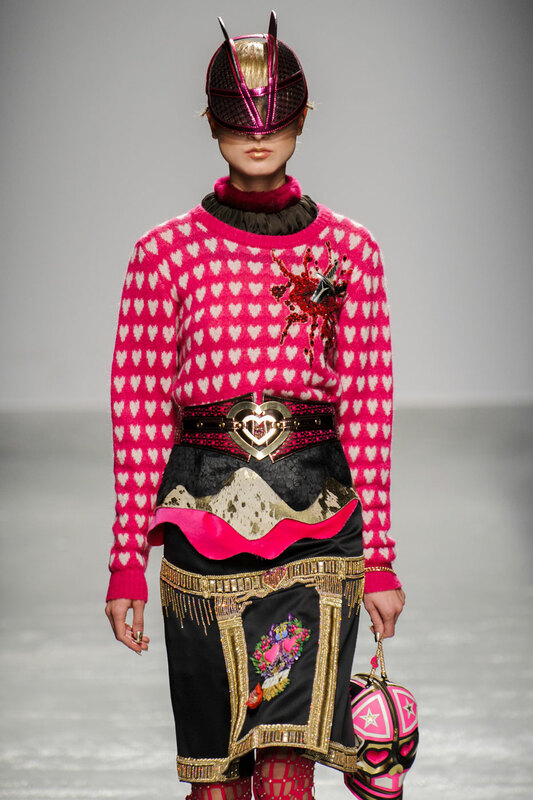 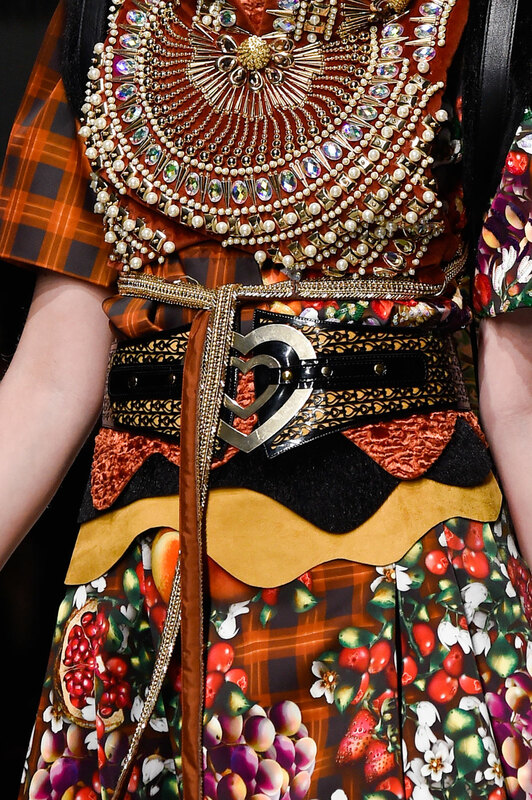 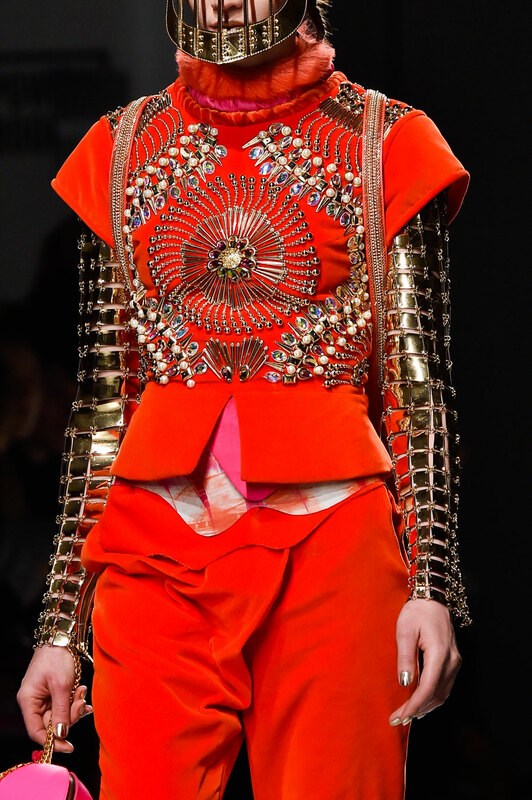 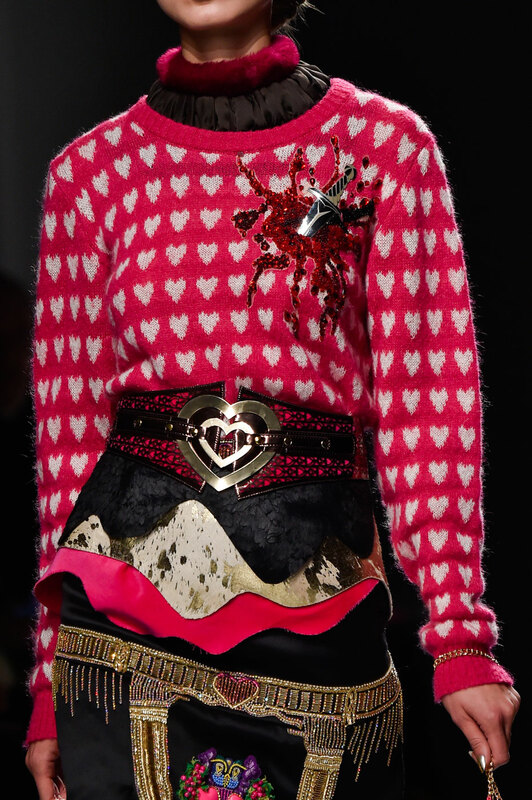 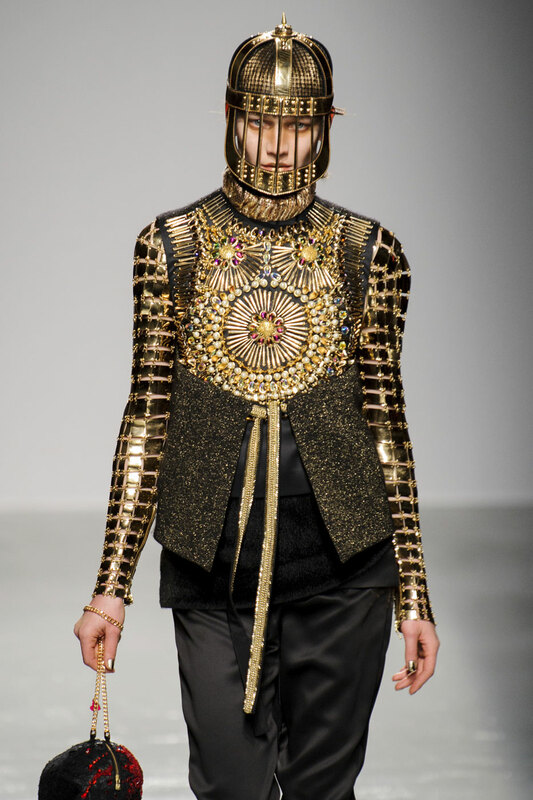 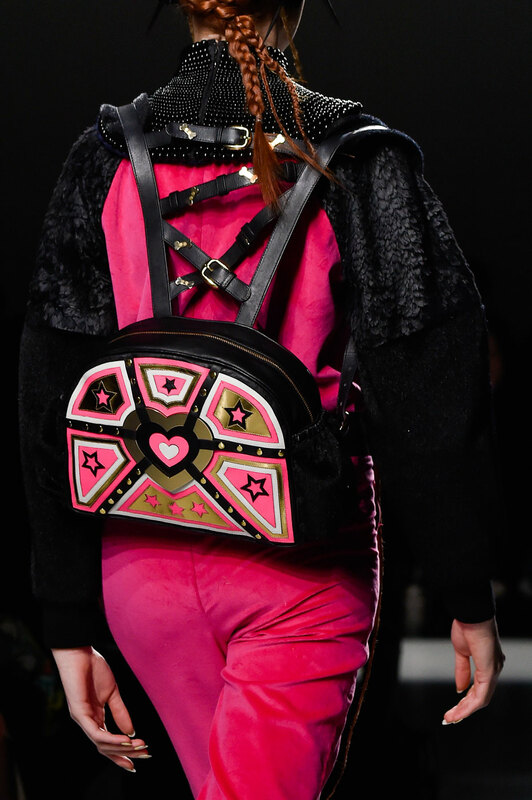 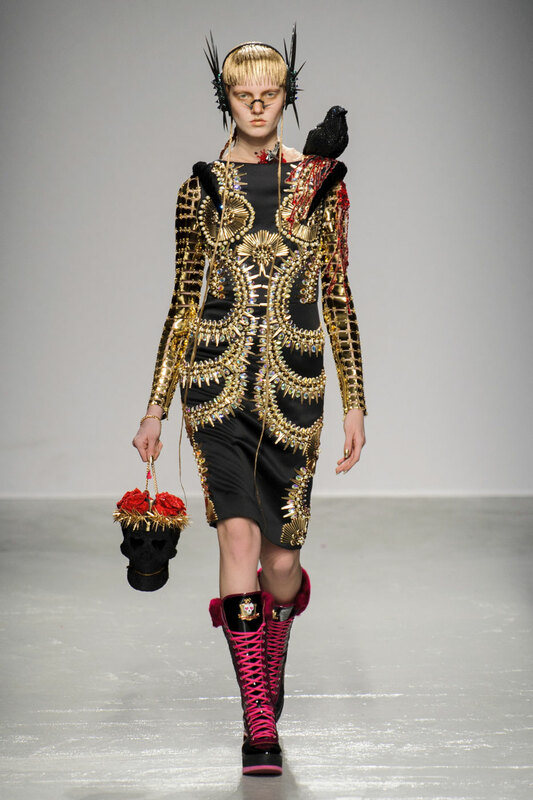 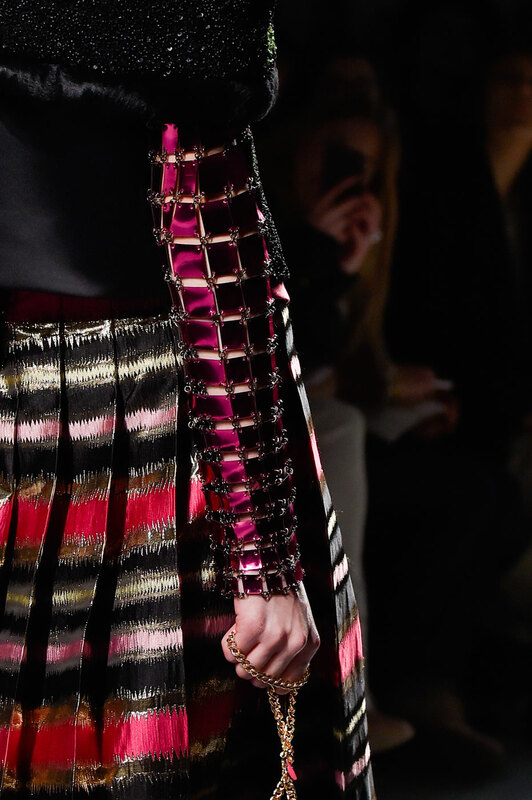 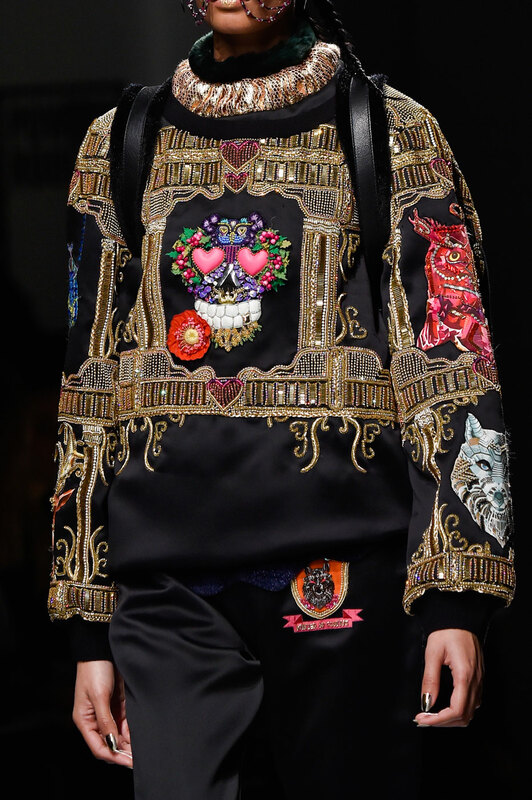 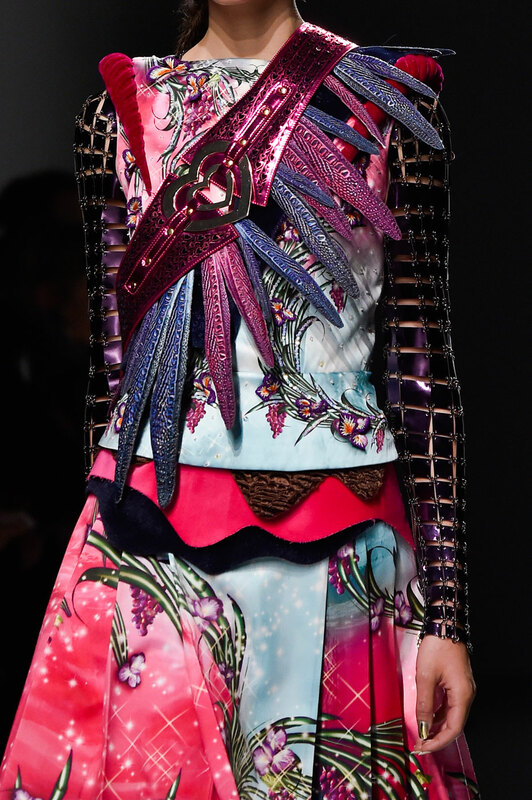 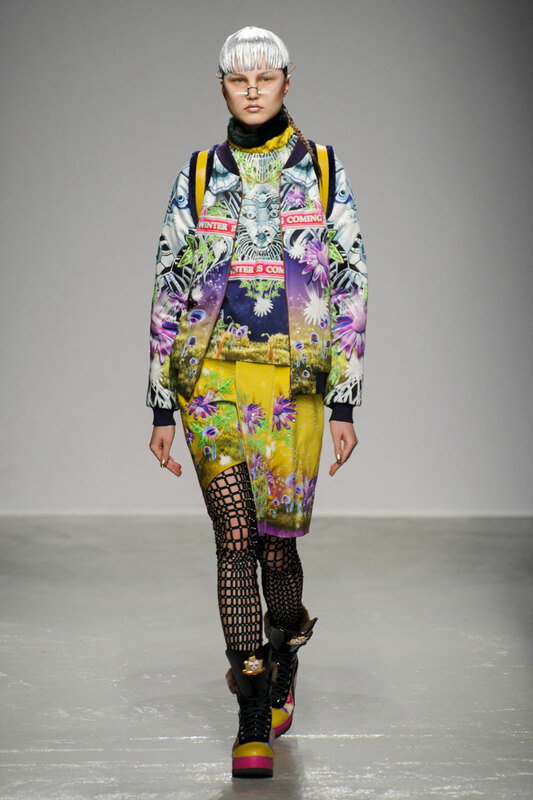 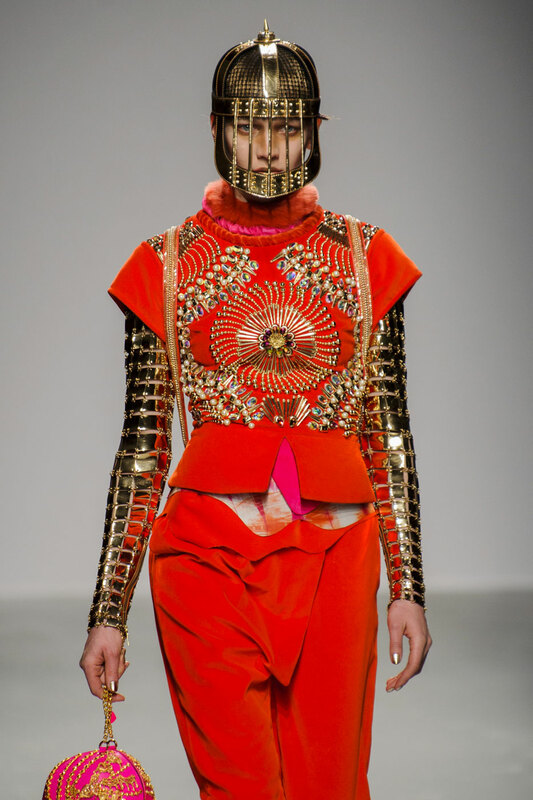 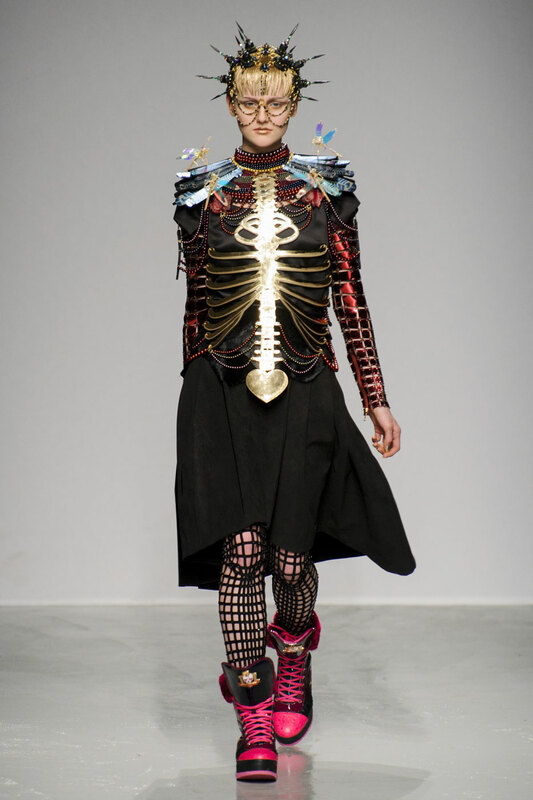 Ornate blazers, hearts stockings and thick gladiator style belts contributed to the fierceness of the designs. 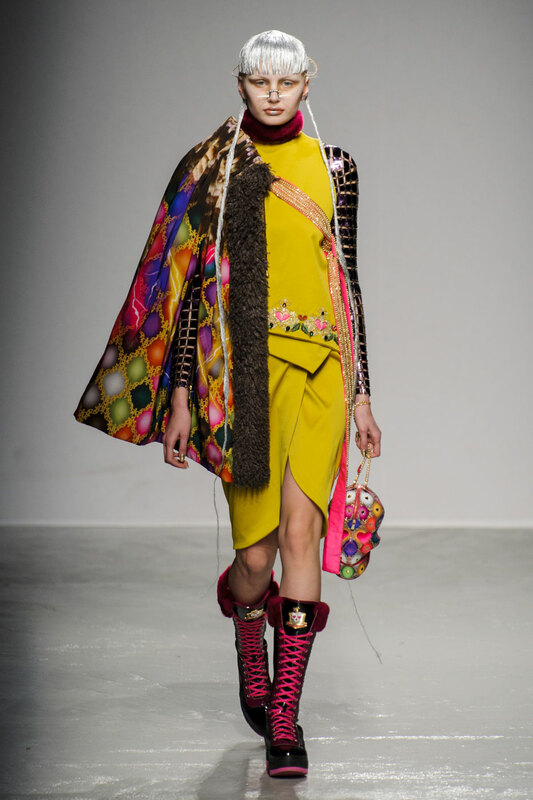 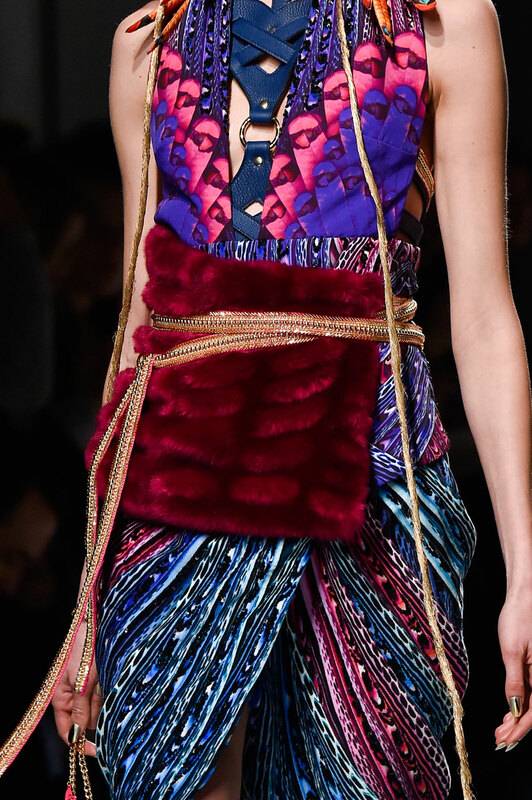 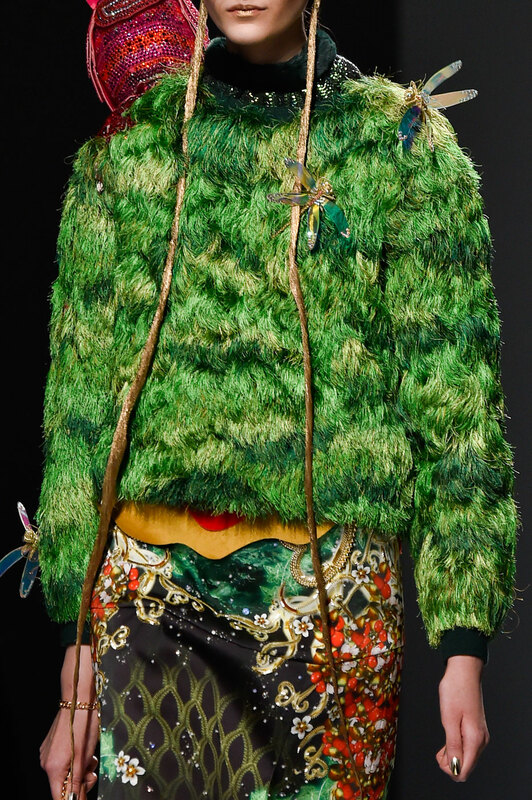 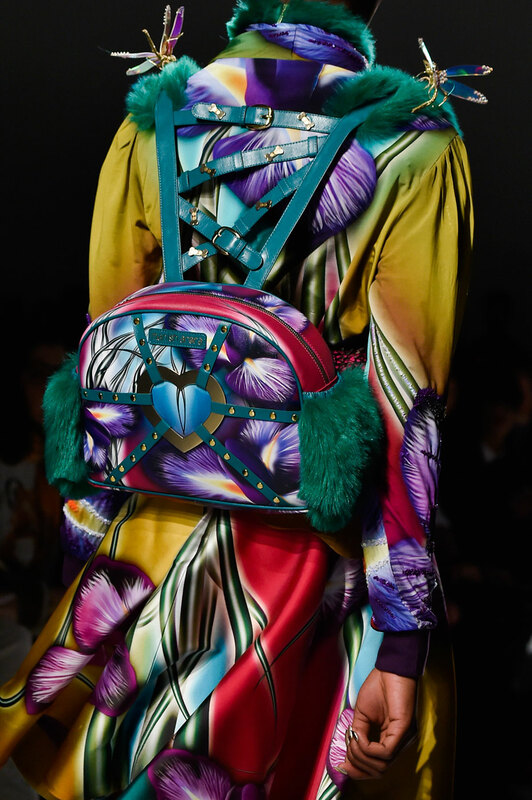 A rich palette of psychedelic colours and the clashing of fabrics created outfits that scream out energy, youth and playfulness. 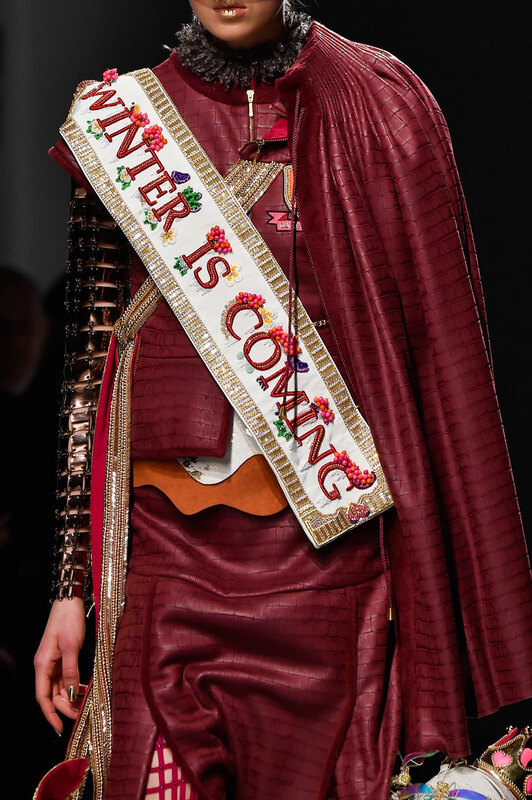 Heavily inspired by the American fantasy television drama Game of Thrones, the collection states “winter is coming” (emblazed across fuchsia sweaters and whimsical themed bomber jackets) depicting a world in which the summers are long and the winters are longer. 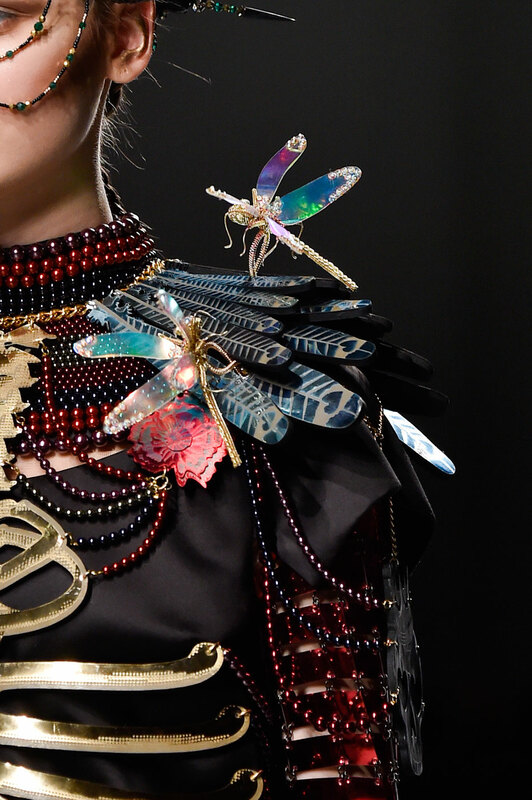 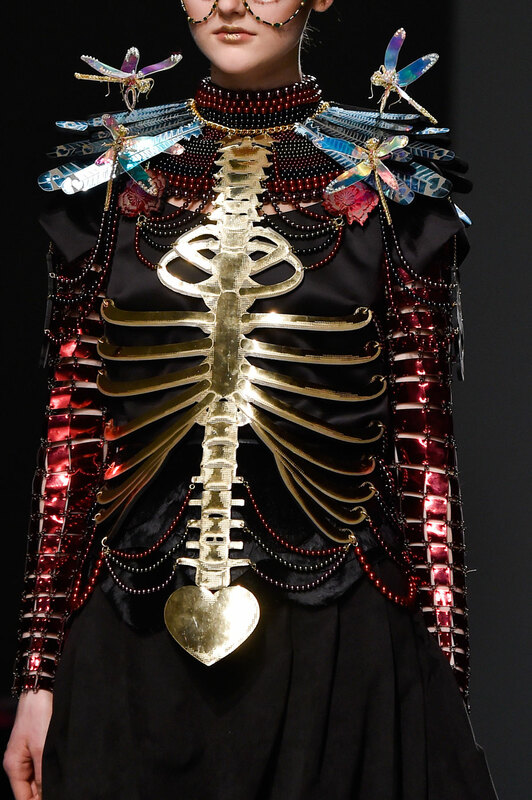 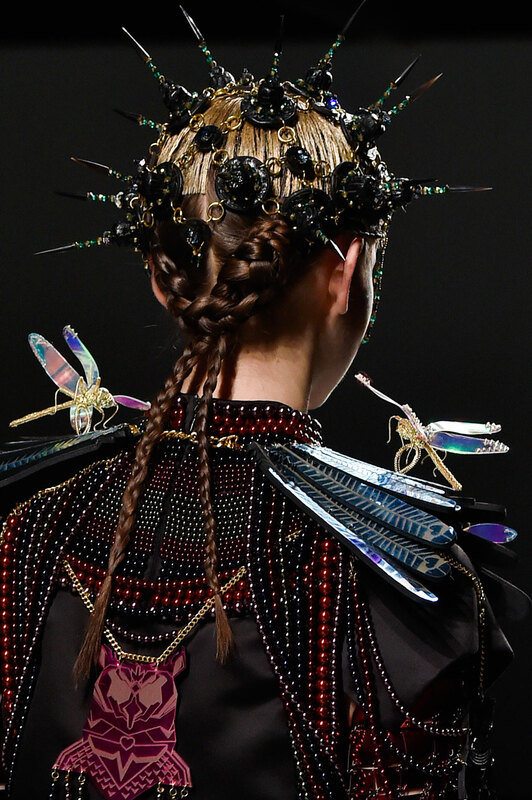 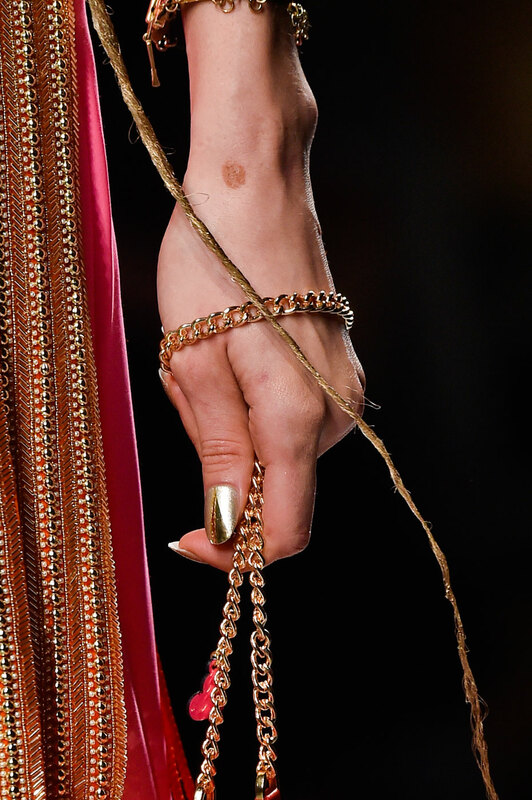 From the birds and owls perched upon shoulders to the spiked golden gears printed on dresses, it was all reminiscent of the fictitious world it represents. 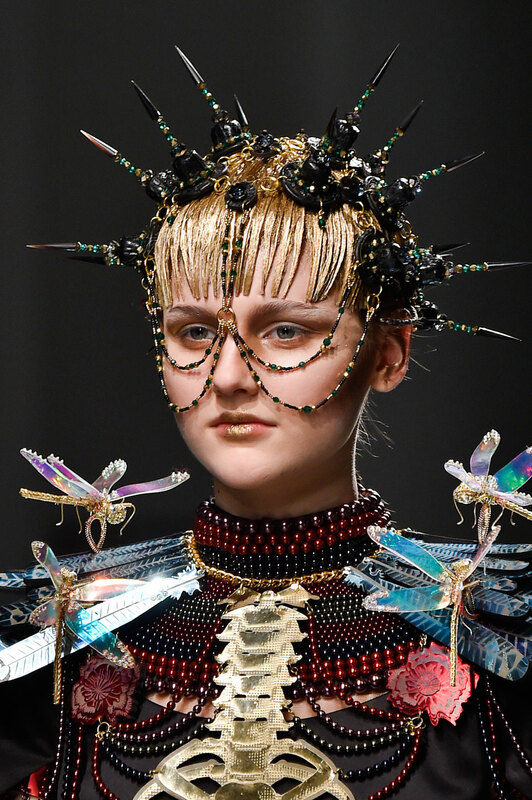 It was the ultimate fantasy collection. 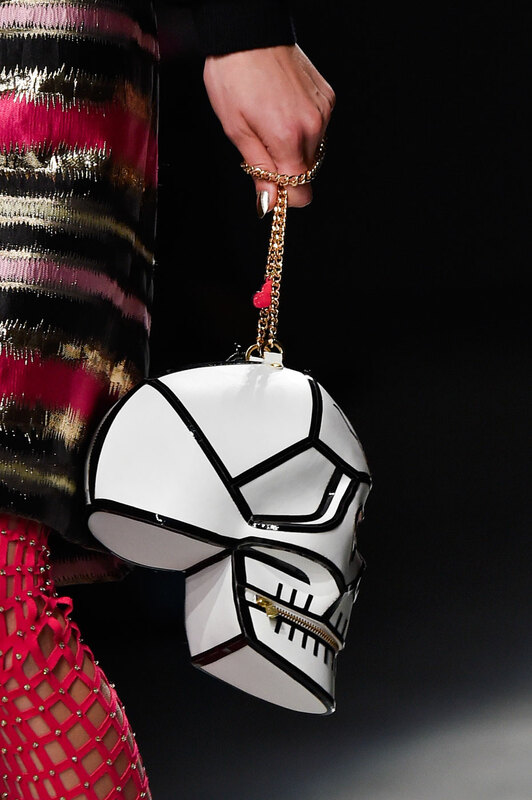 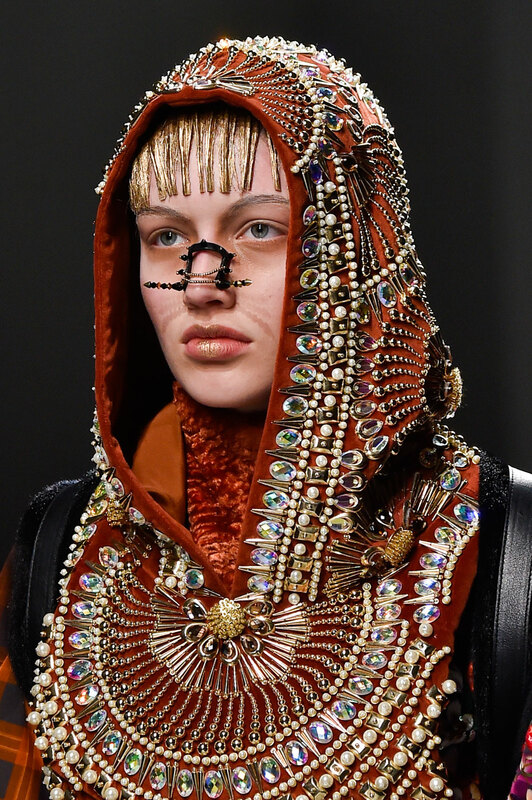 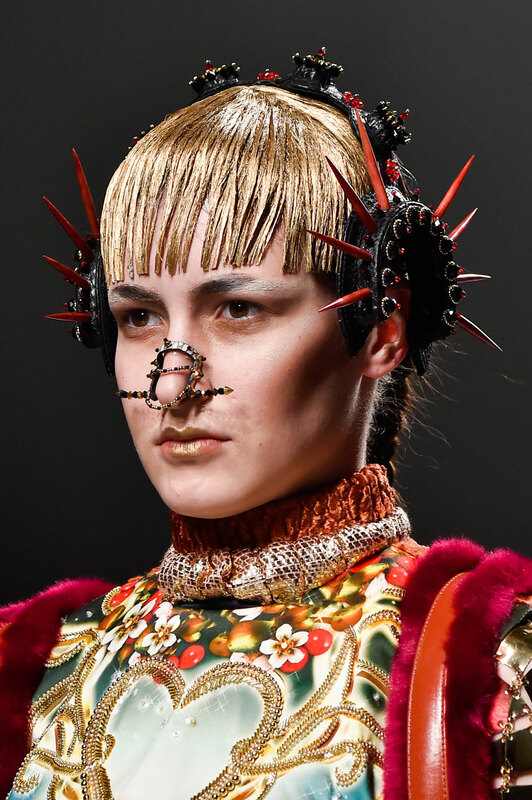 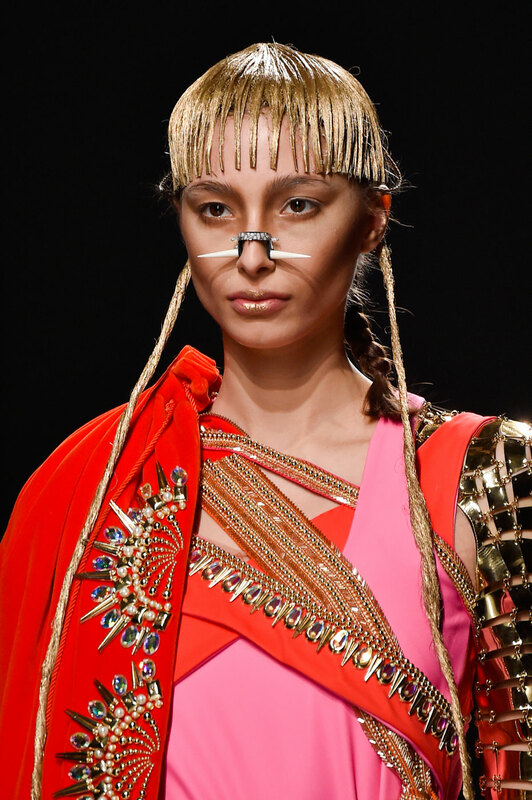 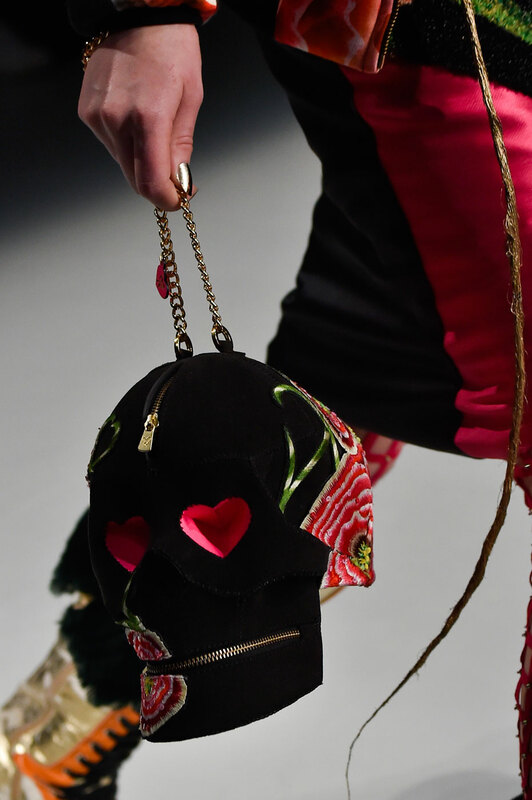 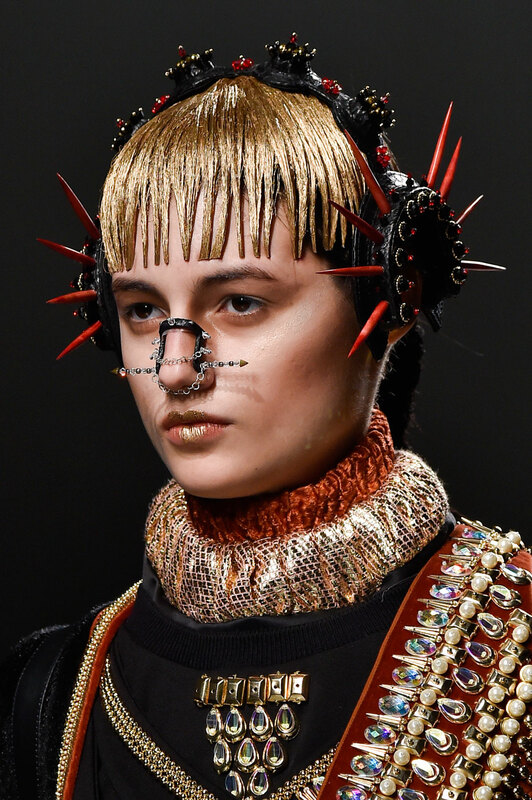 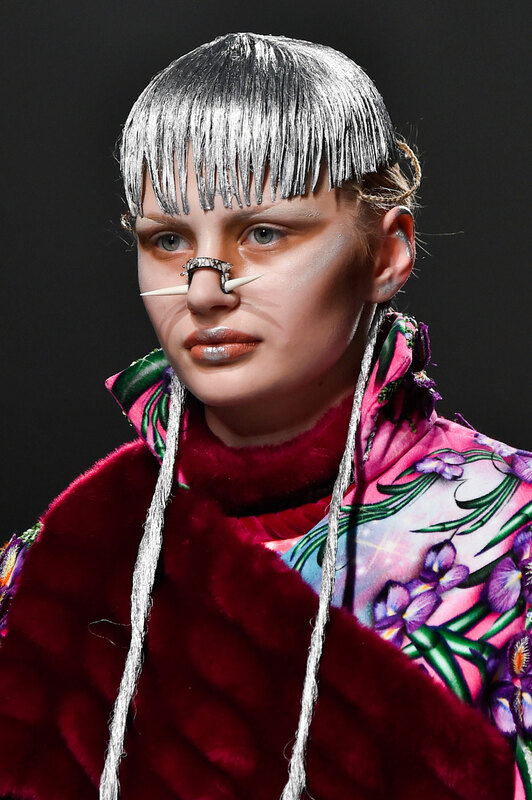 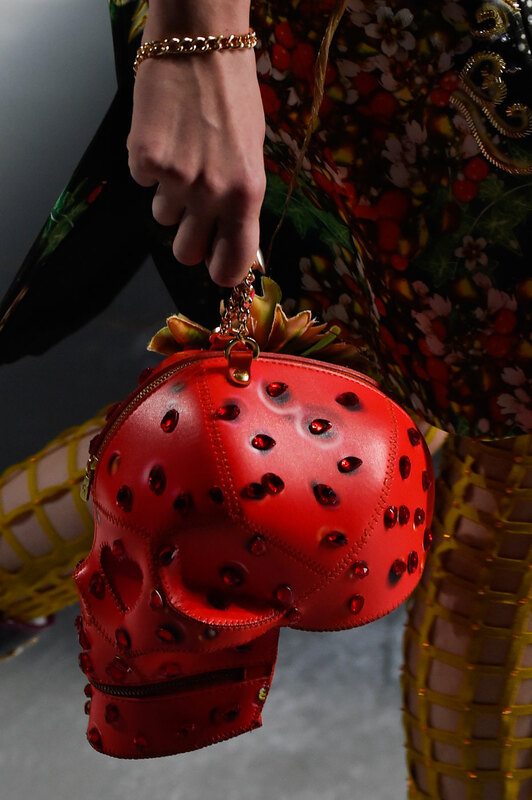 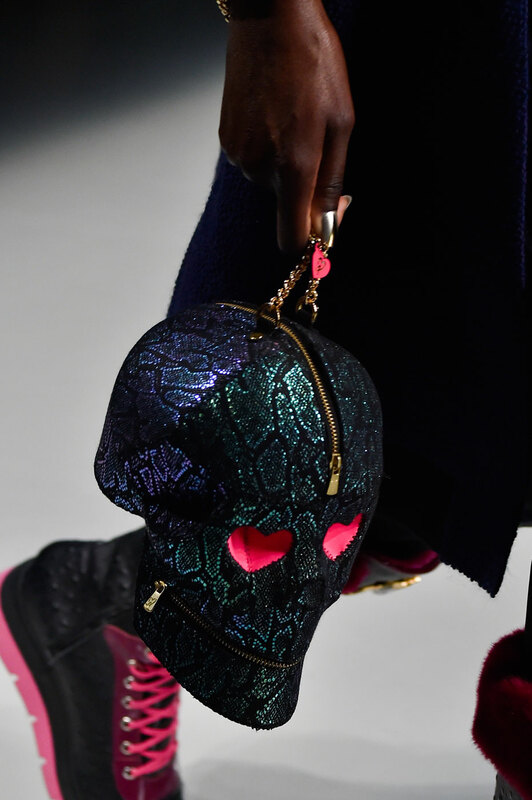 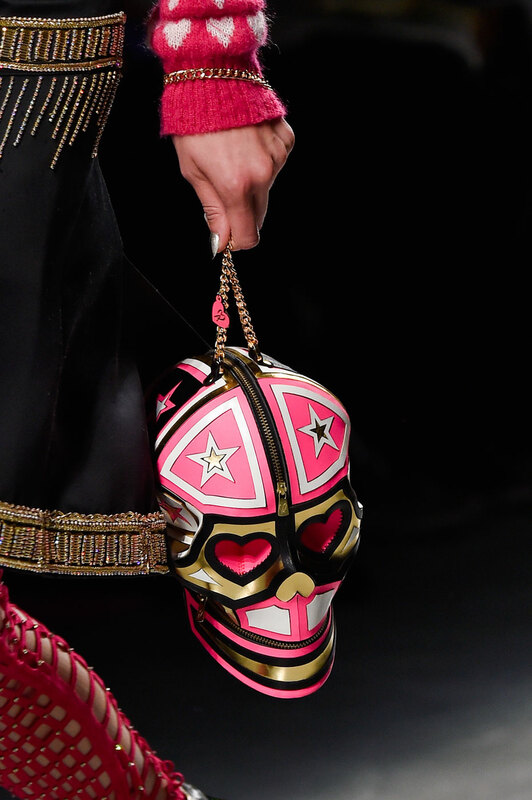 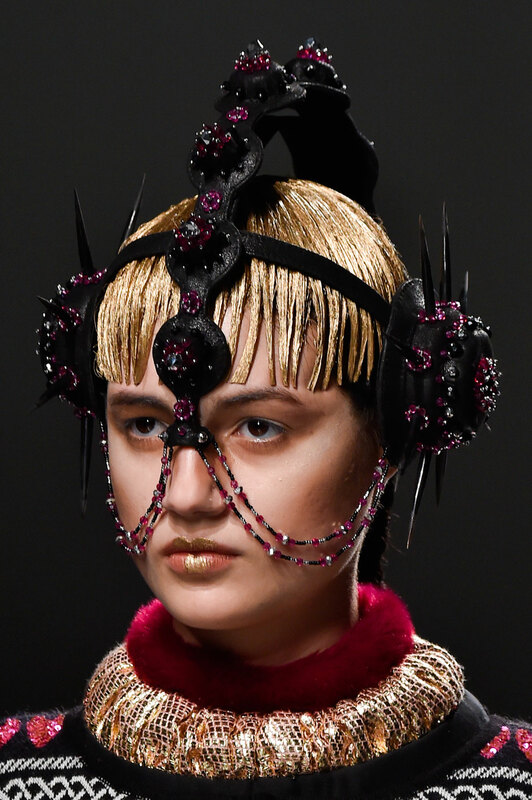 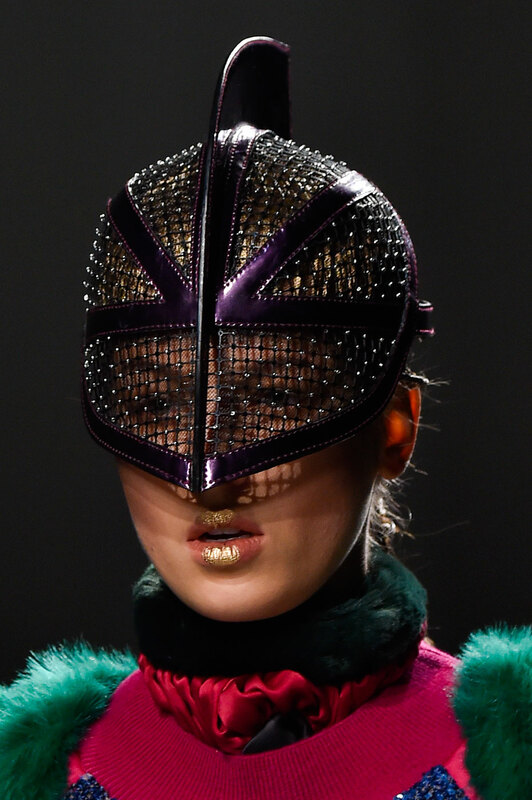 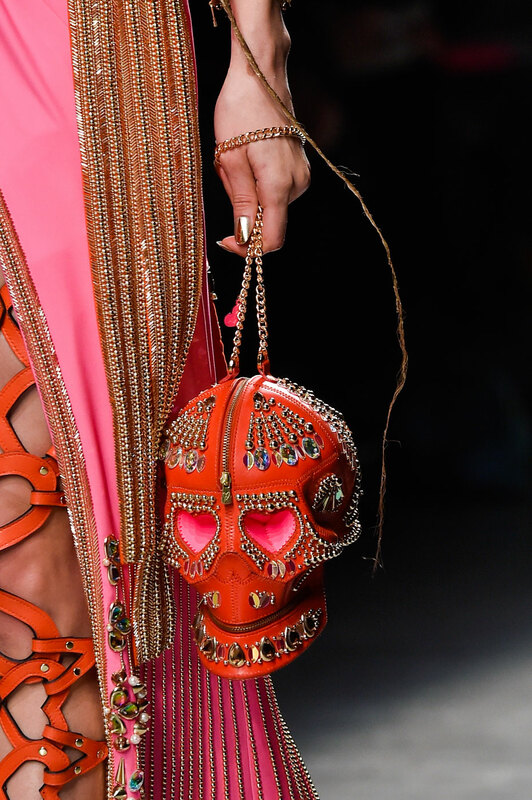 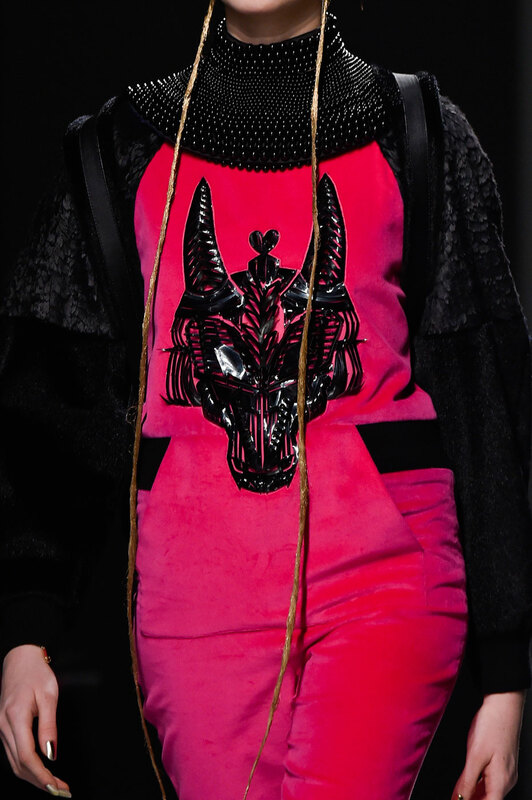 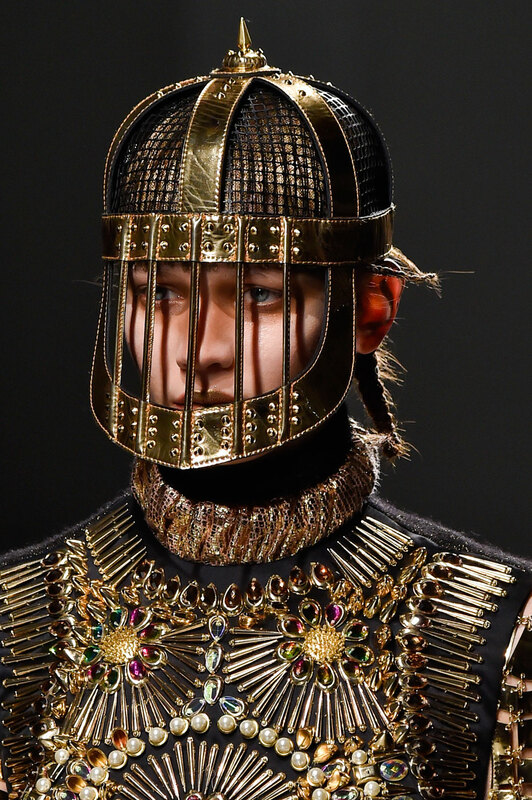 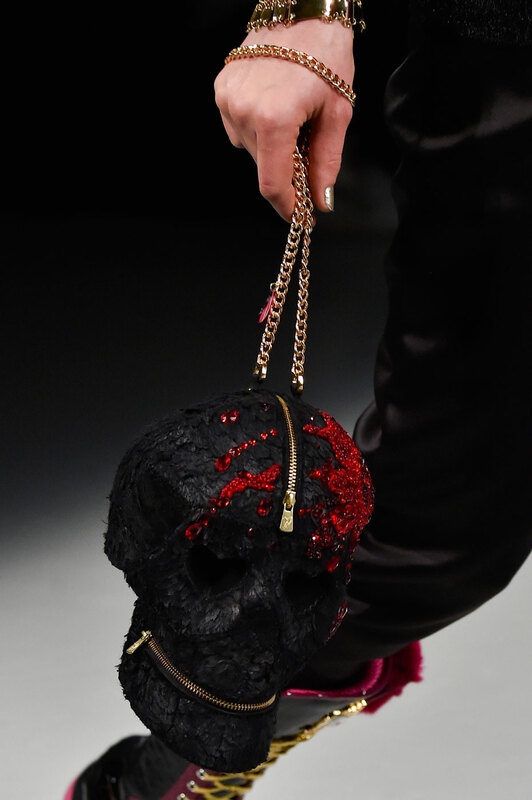 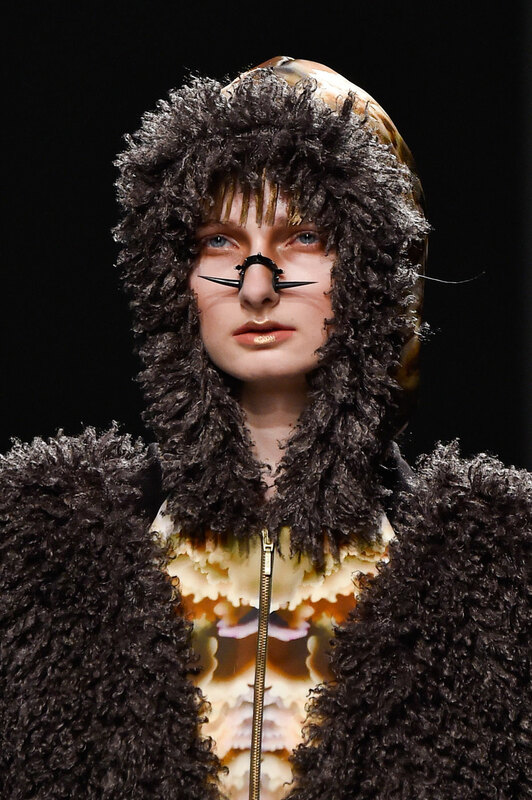 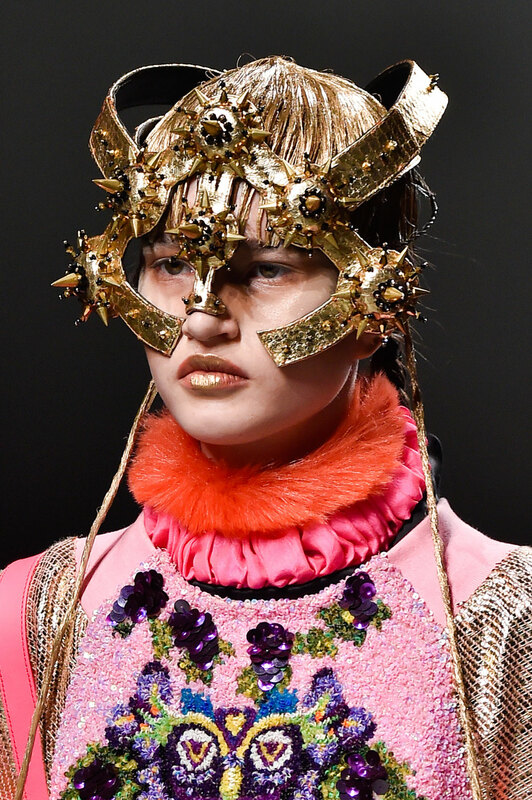 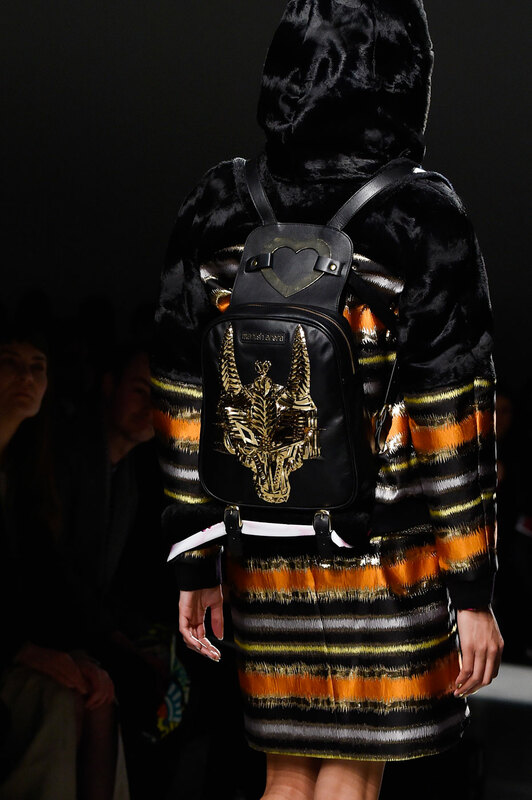 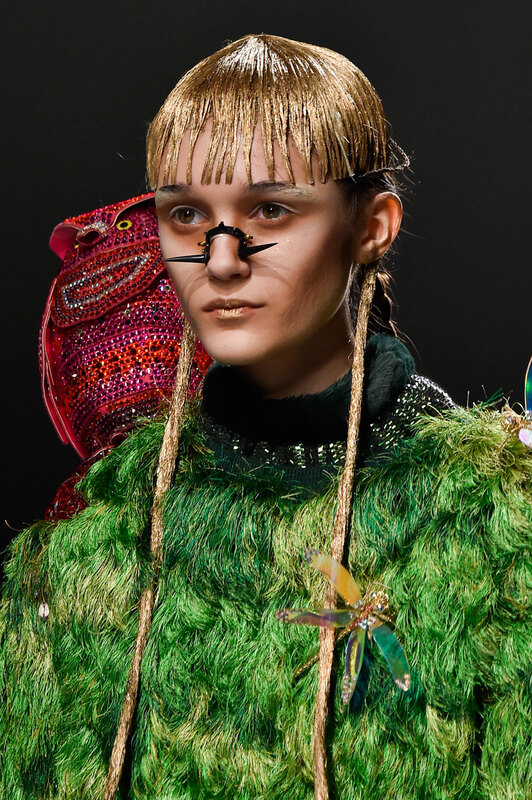 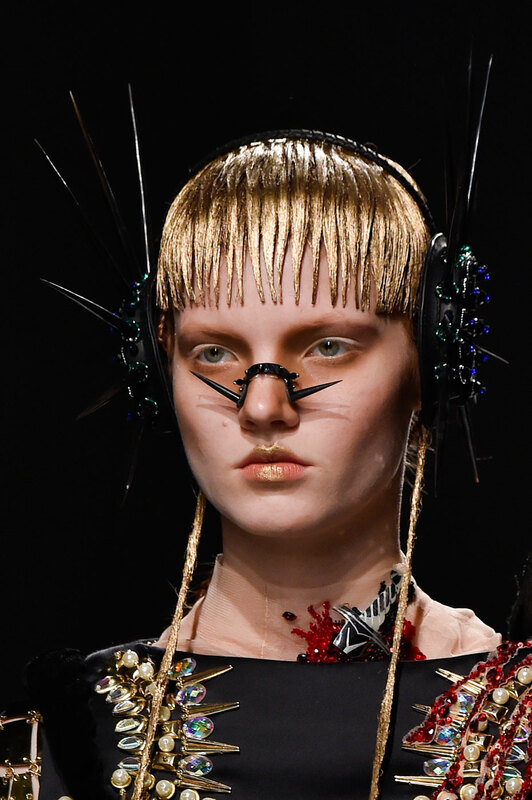 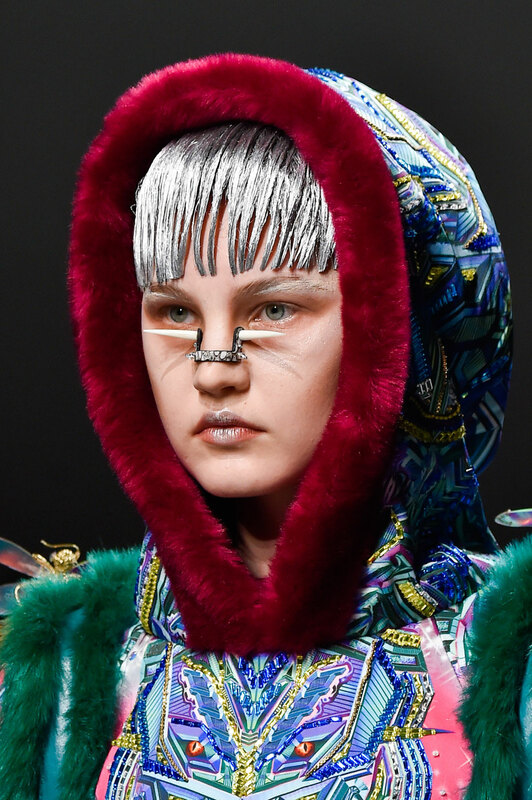 The tribe of warriors stomped down the catwalk at Palais de Tokyo donning embellished skull head bags, intricate headgear and a metallic gold lip. 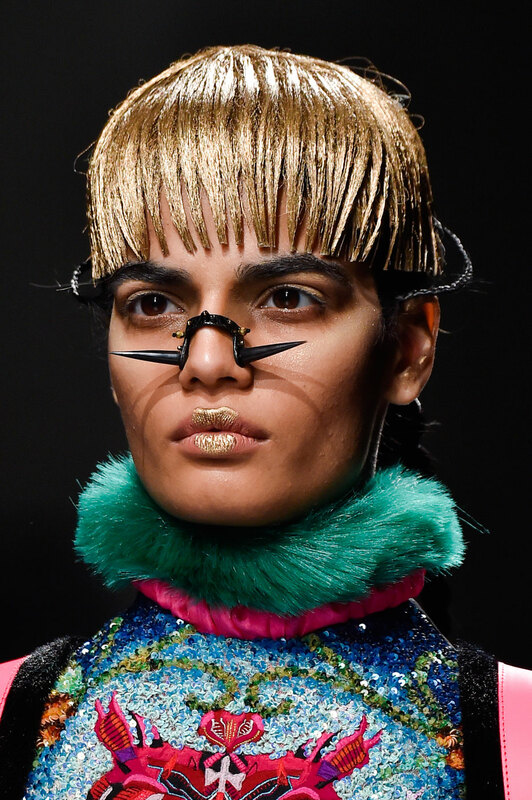 As flamboyant and over the top each Manish Arora collection seems to get, it takes us a step closer into the exuberant mind of his.